Hi there, well it’s been a very busy month and i’m away to Lewis for the weekend (helping a friend celebrate her birthday!) so i thought i’d do a quick post to summarise what’s been happening over the last couple of weeks. 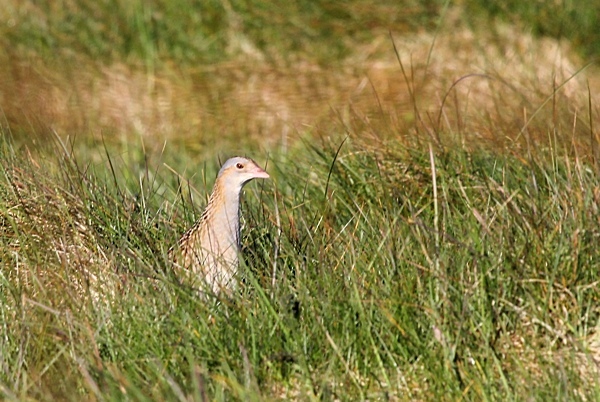 The weather has continued very good – dry and mild mostly, so we’ve been able to do quite a bit more chick chasing. You know you are coming to the end of “chick season” though when you spot a young Lapwing or Oystercatcher, jump out of the van to chase it and it leads you a merry dance and just as you are about to catch it, gasping for breathe, the darn thing flies off!! The machair is starting to look amazing now and it never ceases to amaze me the sheer variety of flowers that grow there. It’s quite surprising (well, to me anyway) the length of the breeding season. 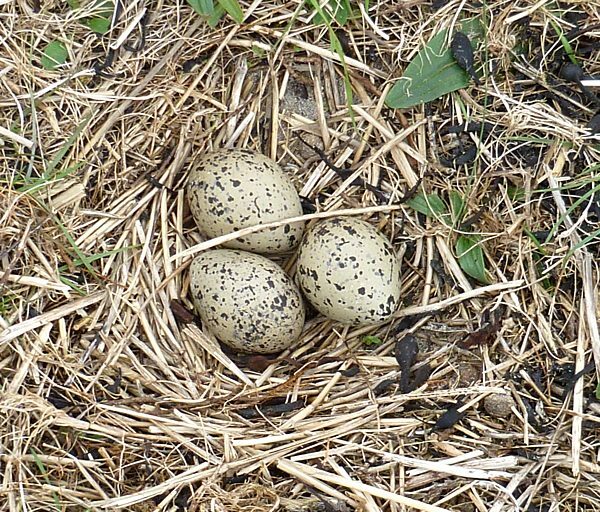 As some birds are almost ready for fledging – a Lapwing has an incubation time of 24-29 days then another c.33 days for the nestling to become independent (Harrison & Castell, 2002, p.140) there are still birds on nests – we recently found this Ringed Plover nest. 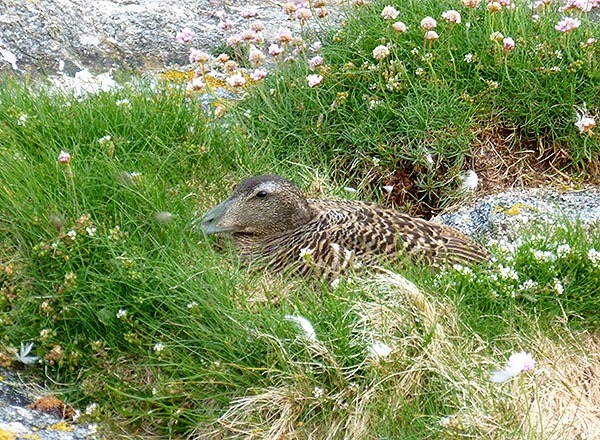 We were able to ring some Common Gull chicks, and while searching for the chicks i almost stumbled upon an Eider sitting quietly on her nest – i must have only been two feet away and she just sat and looked at me, she didn’t budge one bit, so i apologised to her and crept away. 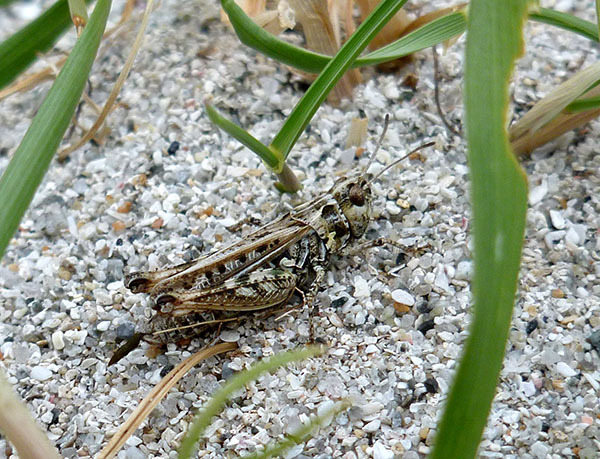 A walk down to the beach on a warm sunny day was very enjoyable – we found this grasshopper – we are told that there are only two species that occur here – Green and Mottled – so i’m presuming that this is Mottled?! As usual the beach was amazingly quiet! 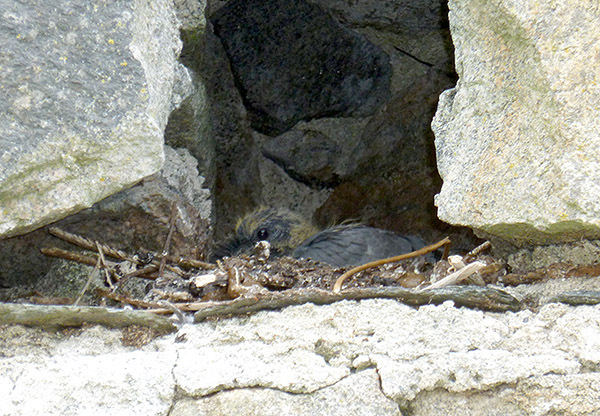 We found a Rock Dove nest but didn’t ring the youngster that was in there – it looked a bit big and we didn’t want to alarm it and cause it to leave the nest prematurely. 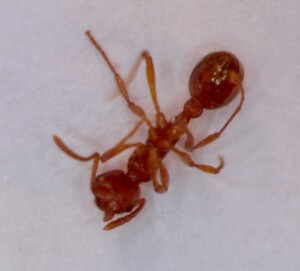 Found this ant near the garden, i sent the picture to Rhian and she replied to say that it was the same species as the ones we’d most commonly come across, Myrmica ruginodis. Ah well, you gotta keep trying! 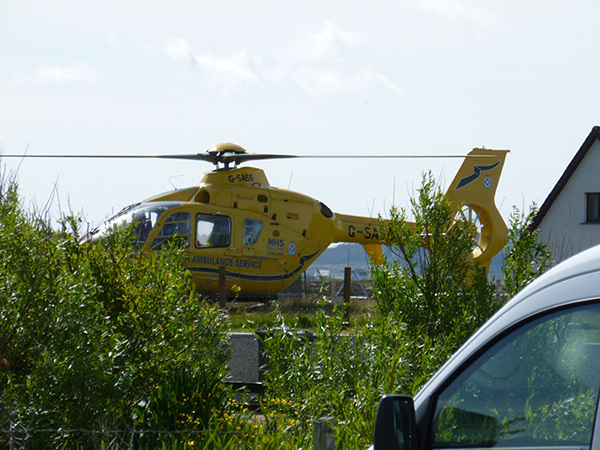 While sitting in the office last week i heard a loud noise and glanced up to see the air ambulance helicopter flying really low across the croft at the back of the house. Wow! I thought. A couple of minutes later there was even more noise at the front of the house and i looked out to see the helicopter landing in the garden opposite. I was a little stunned to start with but managed to dash out and grab a photo. The jungle drums were working overtime and before the rotors had even stopped my neighbour phoned and gave me the low-down on what was going on 🙂 Happily nothing life-threatening and the lady it had come for walked to the chopper unaided. She had had an op the week before and had developed some pain and needed to be taken back to the hospital in Stornoway – the quickest, easiest and safest way for that to happen was by helicopter. Great service! 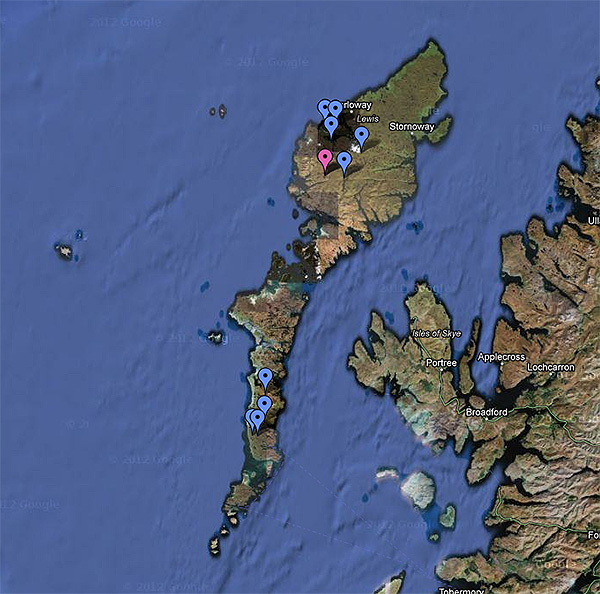 Once i’m back in Uist early next week i’ll update the ringing summary for June. 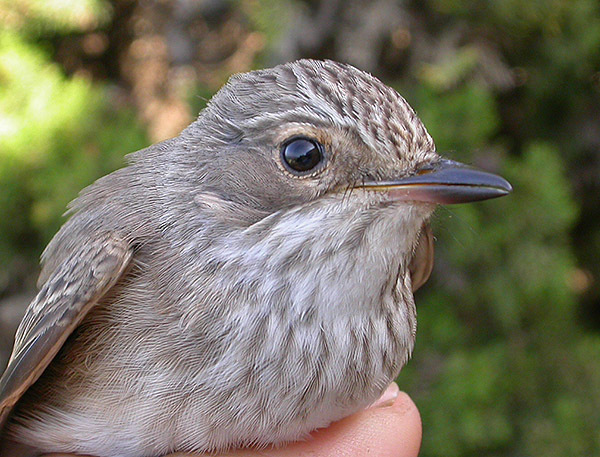 Harrison C. & Castell P., 2002, Collins Field guide to Birds Nests, Eggs and Nestlings. 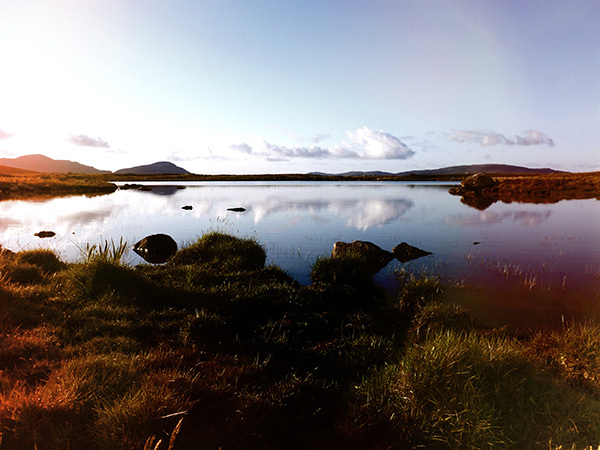 The week started out with a trip up to North Uist last Saturday to Claddach Kirkibost. 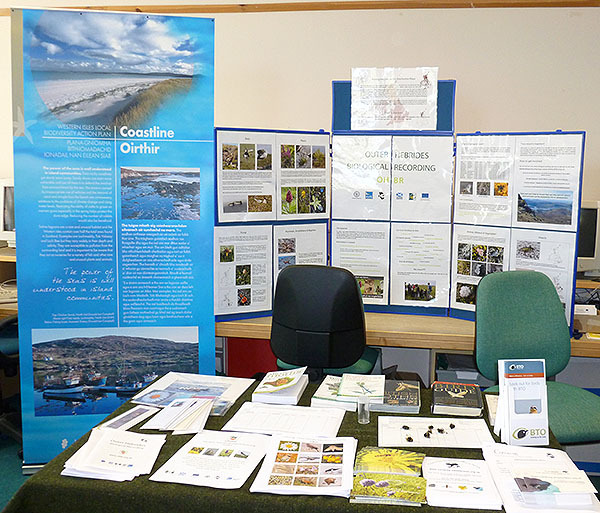 Bill next door and myself had volunteered to man the Curracag (Outer Hebrides Natural History Society) stand at the “Watch out for Wildlife in Uist” event. The other stands were occupied by representatives from the Whale and Dolphin Conservation Society (WDCS), Fiona Crouch from The Shore Thing project run by the Marine Biological Association, the Royal Society for the Protection of Birds (RSPB) and the Machair Life project. I think that in the past people/bodies/institutions have been over to the islands studying various aspects of the natural world here and the findings and sightings have disappeared somewhere into the ether. When i got home we noticed a pair of Mute Swans in the field at the back. They had 7 cygnets with them which didn’t look more than a day or two old. 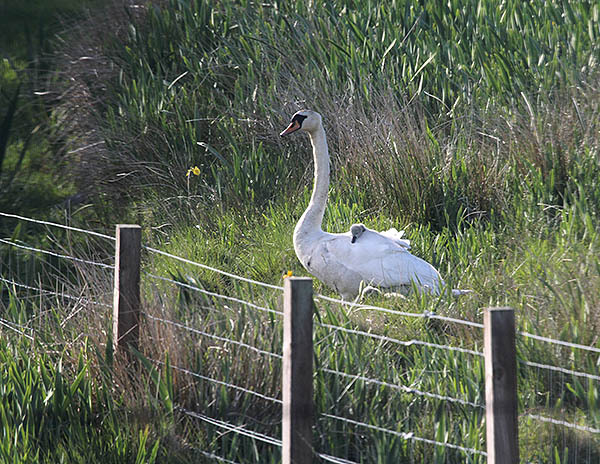 One of the cygnets was hitching a ride on the female’s back. Bill next door also got an amazing photo of them – a sheep had approached the family and the male swan took on a threatening pose – wings up and hissing – Bill said that the sheep then walked forwards towards the male swan! Oops bad move! The photo Bill took can be seen on the Curracag Wildlife News forum at http://www.curracag-wildlifenews.org.uk/viewtopic.php?f=15&t=266 Click on the thumbnail there for the larger image. Sunday looked like a nice day although the breeze was a little cool. 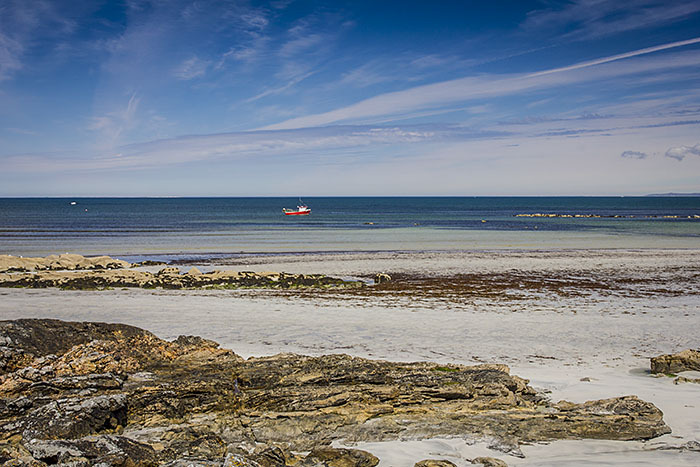 As i was now having to travel up to Benbecula to do the Shorewatch training i thought that i may as well travel earlier and join in with Fiona’s Shore Thing which was held at Stinky Bay. Even when you’re over 50 (well, only just!) 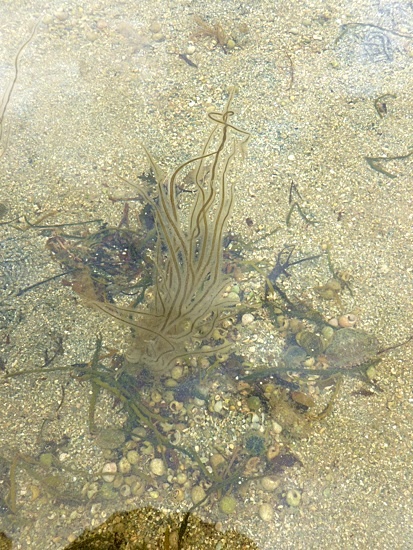 the lure of a morning splashing about in rock pools looking at all the interesting weeds and critters is just too much to resist. 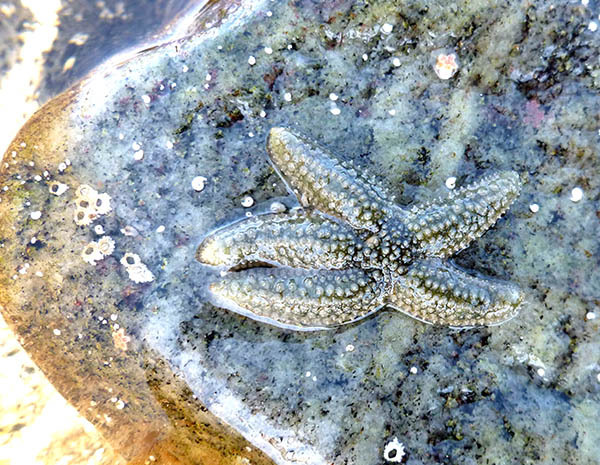 We found a really interesting Breadcrumb Sponge and anenomes and starfish are always good to see. One of the most fascinating sights of the day was when we had finished on the beach and headed back to the jetty. 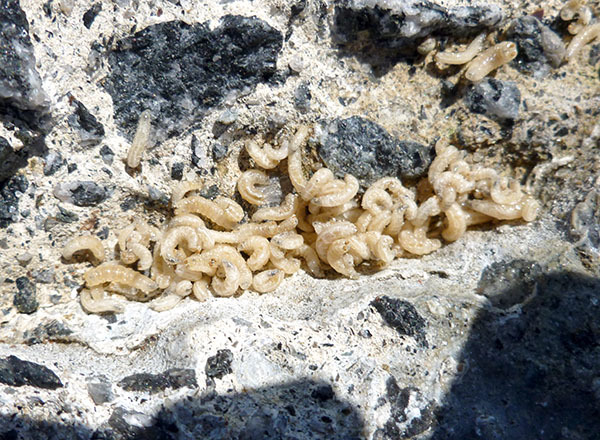 There were thousands upon thousands of maggots on the quayside – i have no idea what species these larvae were and i guess they had hatched sometime between the tides. Later on in the day the tide was very high, over the jetty so they would have all been washed off. A picnic lunch and then off to the WDCS Shorewatch training. There were 3 new recruits and we spent the afternoon learning all about how to carry out the Shorewatches, learning about what we might see and how to identify them, the visual differences between dolphins, porpoises and whales. After the theory we all headed out to do a practice watch under the guidance of Kila our trainer and Anya a more experienced watcher. 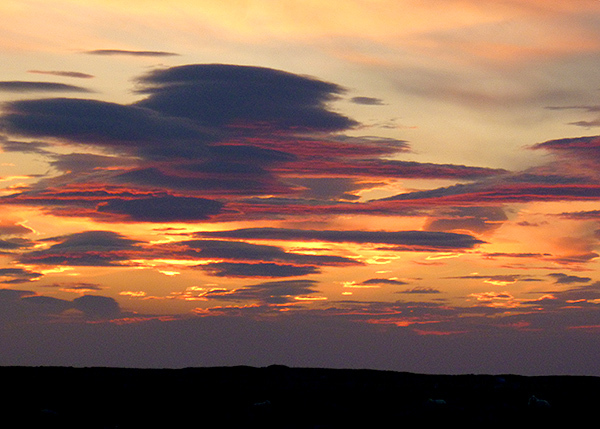 We’ve had some amazing sunsets and sunrises this week – the skies here never cease to amaze me. 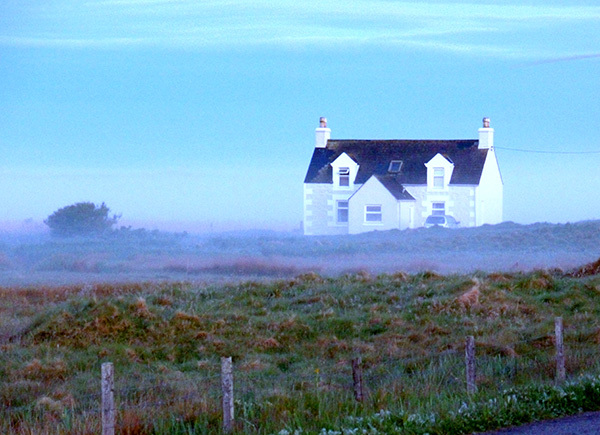 This flat calm scene greeted us early one morning as we headed over to check on the Buzzard’s nest. At the Buzzard’s nest only one chick remains and it has grown quite a lot since we last saw it. It was big enough to ring now. Sadly the other chick was dead at the side of the nest, it had grown a bit since we had last seen it but was not as big as the one remaining. 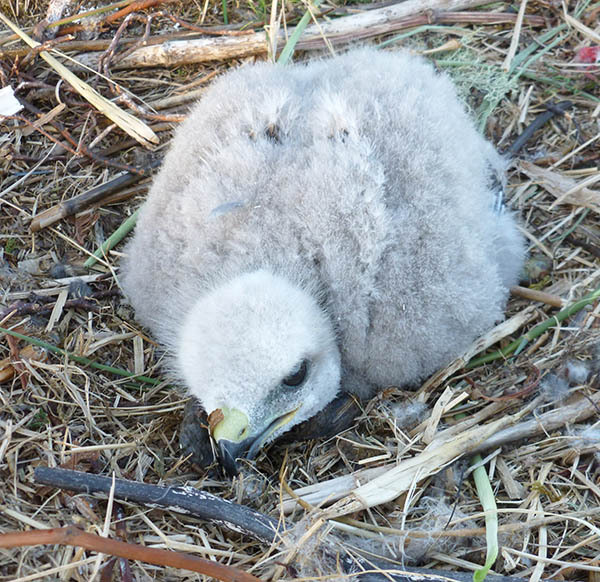 I don’t know how or why it had died, it had no obvious injuries and it hadn’t become a meal for the remaining chick. Hopefully the one that is left will continue to grown and eventually fledge. Another flat calm and misty morning and another fab sunrise saw us up at first light to turn off the moth trap and open the nets. A few summer visitors around, we’ve regularly heard Corncrake and a Sedge Warbler was singing away from the garden next door. 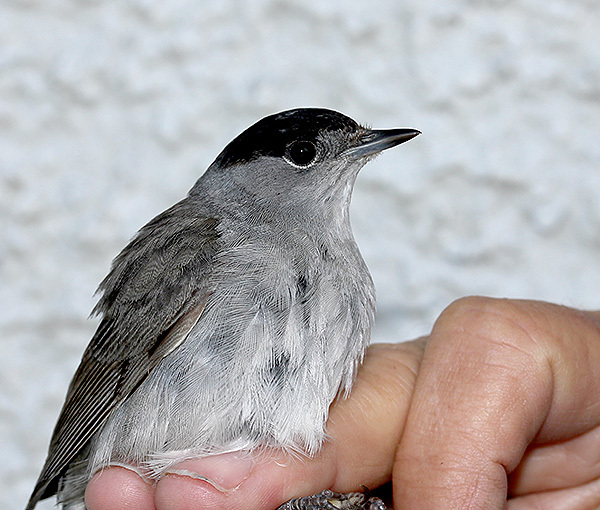 We’ve ringed both Willow Warbler and Blackcap this week as well. 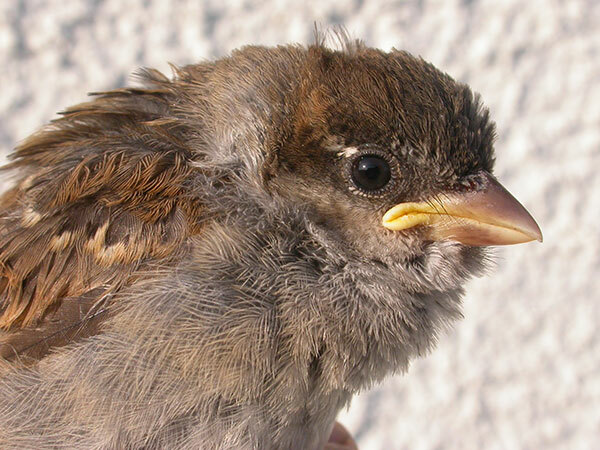 We’re now up to 50 juvenile House Sparrows this season. 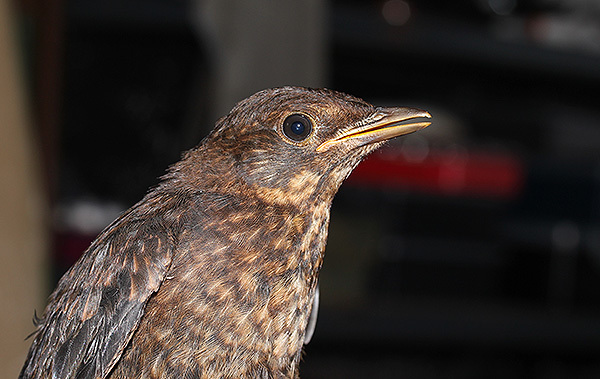 Lots of other juveniles around as well with Robin, Song Thrush, Starling, Blackbird and Greenfinch juveniles all turning up for rings. 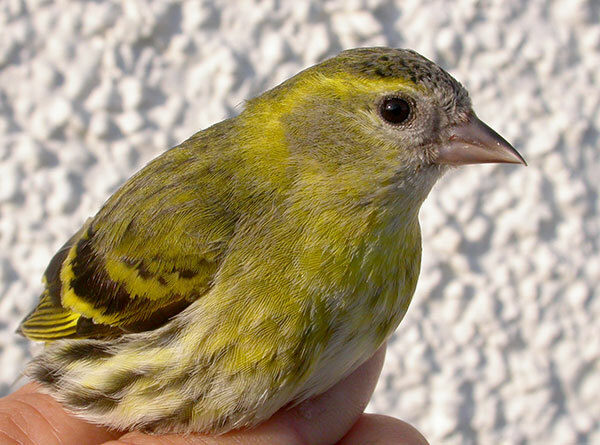 On Monday a pair of adult Siskins appeared in the net, the female of which had a fully developed brood patch.There are still quite a lot of Collared Doves around, in this past week we’ve ringed 6. In their quest to hoover up all our bird seed they somehow manage to squeeze themselves into the ground traps. 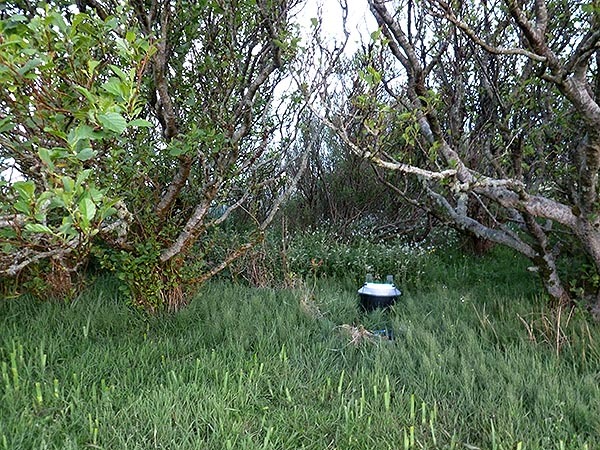 Robinson Midi 15W actinic portable moth trap, nestled under the trees in next door's garden. Some days we’ve had very little in the traps, other days it has been quite interesting. 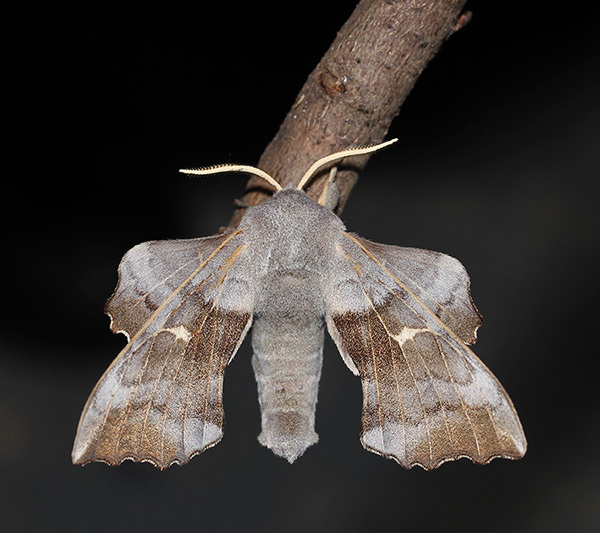 We’ve again had two species of Hawk-moth – Poplar and Elephant. 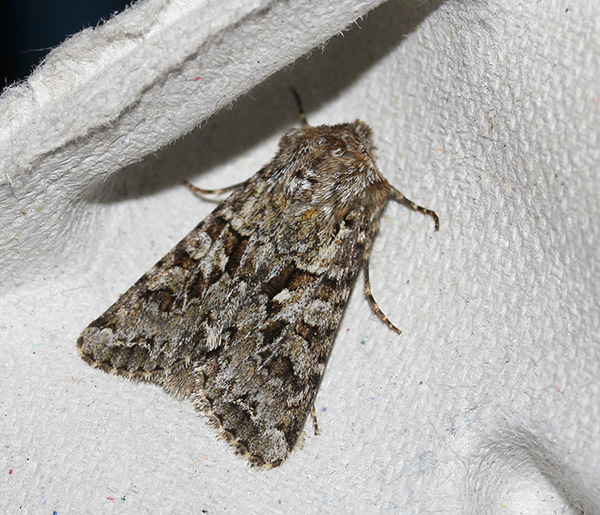 First for the year this week have been Shark, Map-winged Swift, Small Square-spot and Large Yellow Underwing. Late Thursday afternoon we lost our internet connection and by Friday morning it still wasn’t back on. What was going on? We eventually found out that thieves had tried to steal a large cable on the mainland which they thought was copper wire (the scrap value of copper is very high at the moment). It turned out that the cable was fibre-optic and it got damaged in the attempt. Thousands of homes were affected and we eventually got our internet connection back at around 8.30pm on Friday. 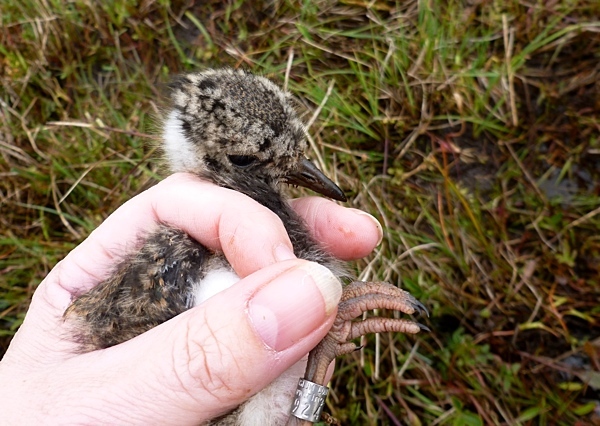 Lapwing chicks were the most frequently ringed bird during May with 115 new pulli ringed! We only had one control this month, a Greenfinch TR02363 which was a second year female with a brood patch. 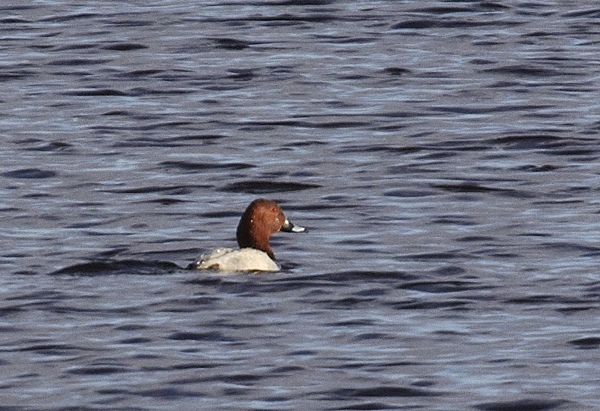 We know that it was originally ringed by Terry, the other ringer here in Uist. We also know, after chatting with Terry that a couple of days after we had controlled this Greenfinch it was further north in South Uist, at Terry’s house where it had been killed by a Sparrowhawk! 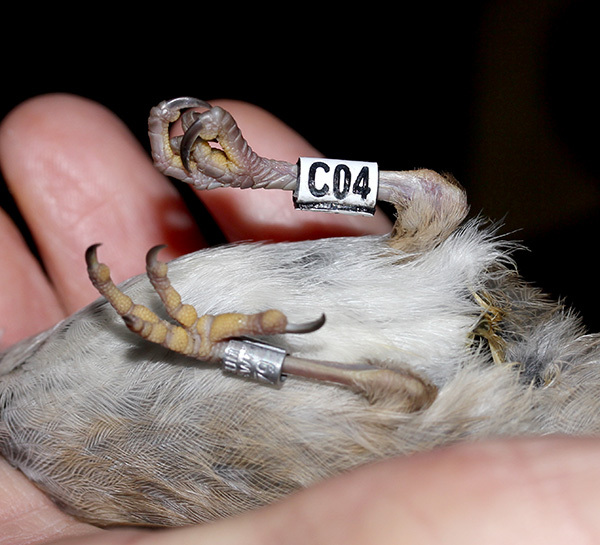 * Once again the incredible number of House sparrow retraps are re-sightings of our colour-ringed birds. Thanks as always go to our neighbour Bill who keeps a daily note of all our colour-ringed sparrows seen in his garden. Wow, what a busy couple of weeks! 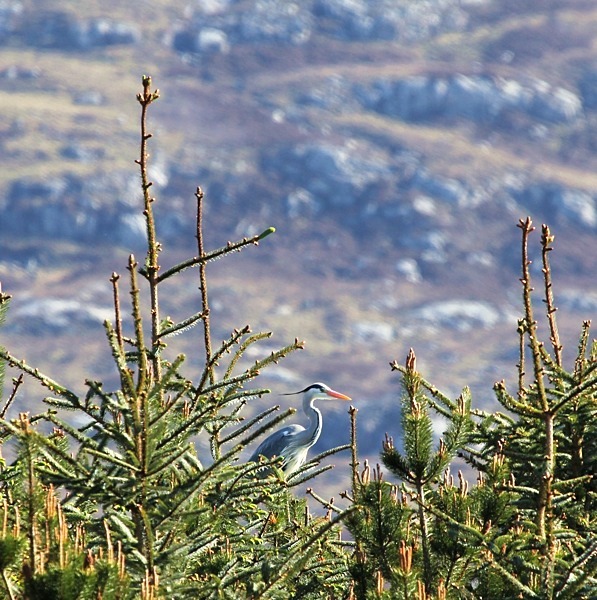 Everything seems to be happening here at an amazingly fast pace – everywhere has suddenly become very green, the trees are about as much in leaf as they are going to be and even the slopes of Ben Mhor, our highest hill, are looking green. 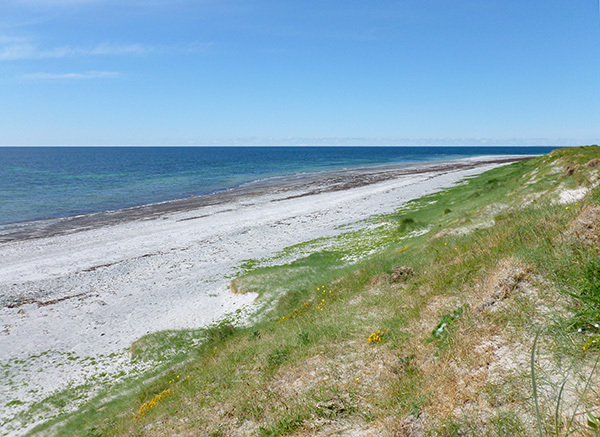 The weather has been amazingly warm and we had 5 days in a row where the temperature was over 20’C. A bit different from last year when the highest temperature we recorded here at Askernish Weather Station was just 19.6’C and we missed that as we were out at the bird observatory in Gibraltar! The Butterwort is out in the damp shady places. 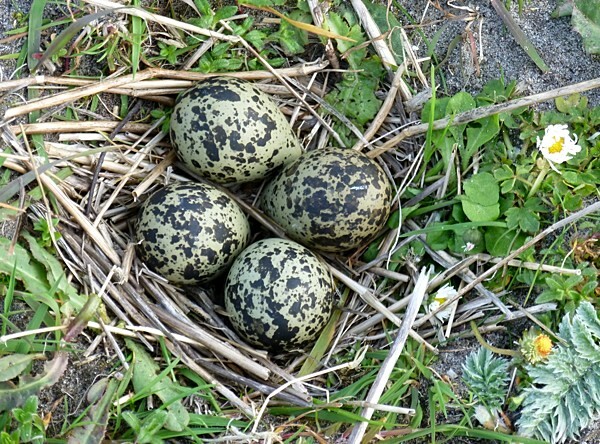 We’ve still been having a ride along the machair every now and again and still finding Lapwing chicks, amazingly some Lapwings were even still on eggs only last week. 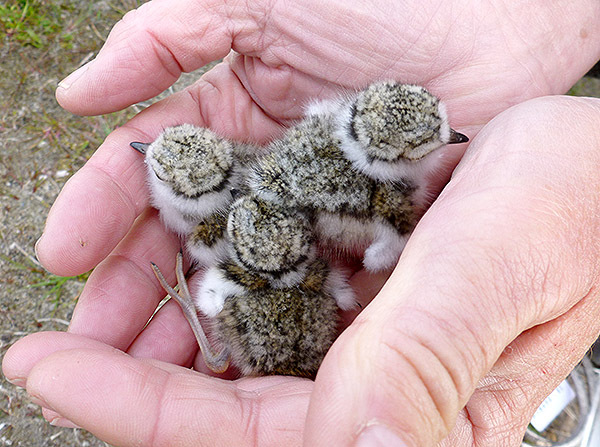 We were very happy to find these Ringed Plover chicks, just tiny balls of fluff. We’ve been keeping our eye on a Buzzard nest, mainly from a long distance by telescope and early one morning (2nd May looking at the Nest Record Card) Ian walked out to check it and found three eggs. Around the 18th May we though we could see small fluffy heads in the nest so on the 24th we walked over to do another check. We found two downy young, too small to ring yet. We don’t know what happened to the third egg, whether it hatched and the chick died (or was dinner for it’s siblings) we’ll probably never know. It was an amazingly calm morning and walking back across the field towards home the sun was coming up making for a gorgeous early morning sunrise. Sunrise - a rare calm day! 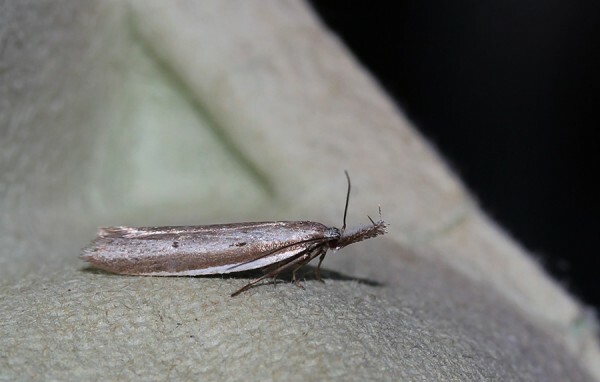 Later on in the day i was sitting on the bench at the front of the house enjoying a cuppa in the warm sunshine when i went to scratch my arm and felt something small and hard. Yuk! 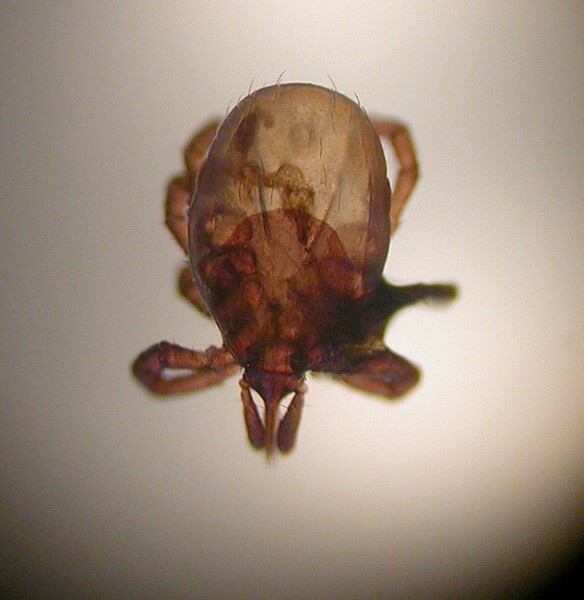 A tick. 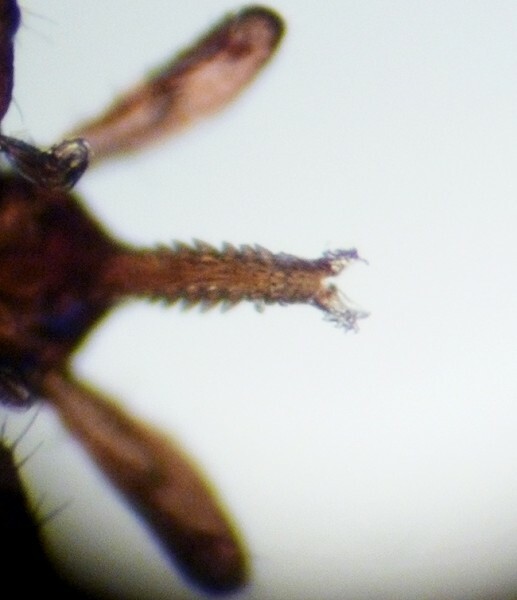 One of the hazards of living an active outdoor lifestyle i guess 🙁 I was able to remove it with a very fine pair of tweezers and put it under the microscope to make sure that i had completely removed the beastie. 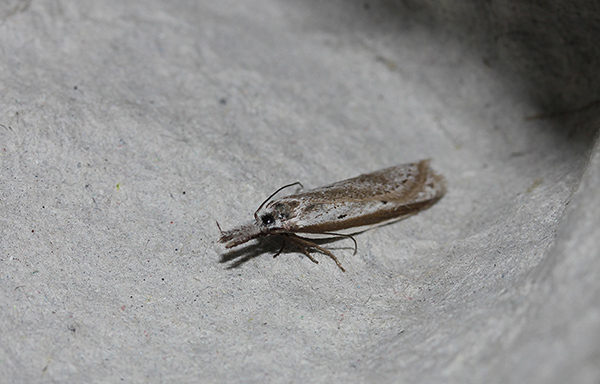 It was very tiny barely 1mm in length. 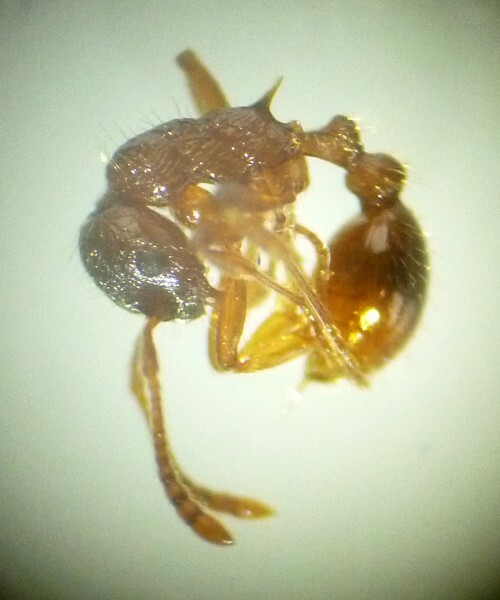 Under the microscope it made a gruesome sight and the mouthparts were a bit like something out of a horror film – a row of double serrations. 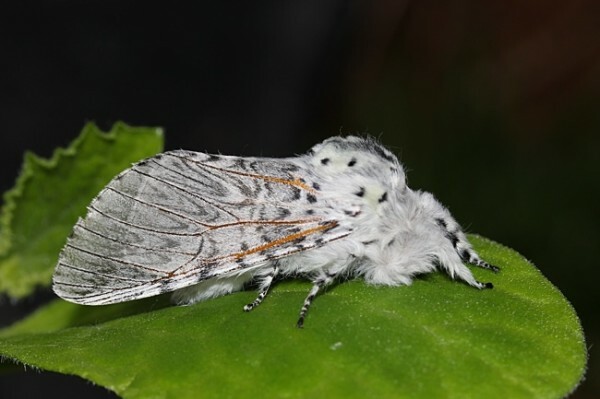 Did the makers of the film Alien get their inspiration from the insect world i wondered. Tick, extracted from my arm! 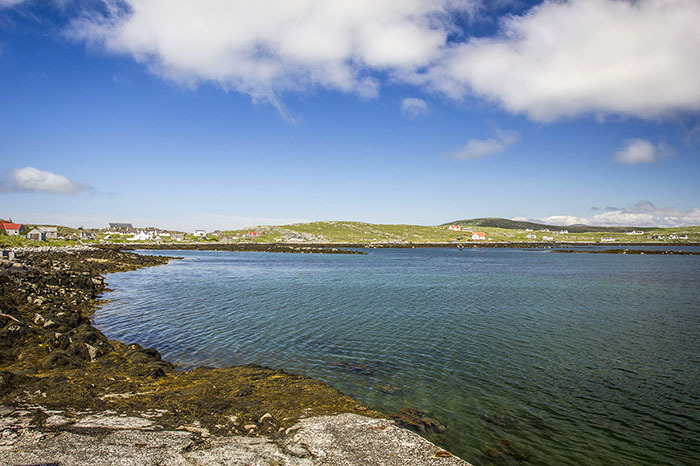 25th May was forecast to be very calm so i packed up the van and headed out to the plantation at Druidibeg to put up some nets. As you can imagine, with the almost constant wind here, the opportunities to mist net are very few and far between – you have to grab every chance you get! 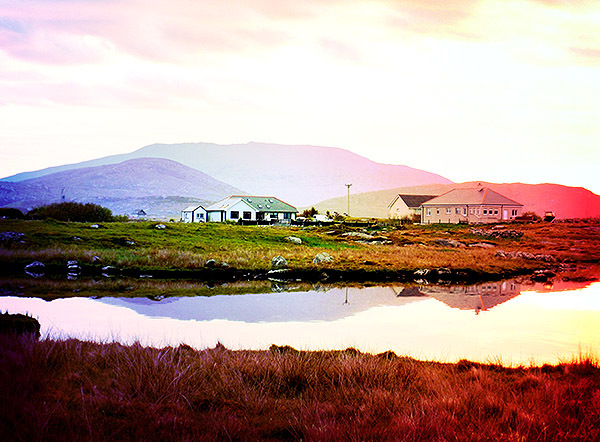 We had previously considered joining the BTO’s Constant Effort Scheme (CES) with Druidibeg plantation as the site. However after the first season trialling CES there we felt that due to the weather there is no way we would be able to fulfil the required 12 visits between May and August. The plantation was pretty quiet although there were quite a few Willow Warblers singing. A juvenile Robin was first out of the net followed shortly by a couple of the Willow Warblers. 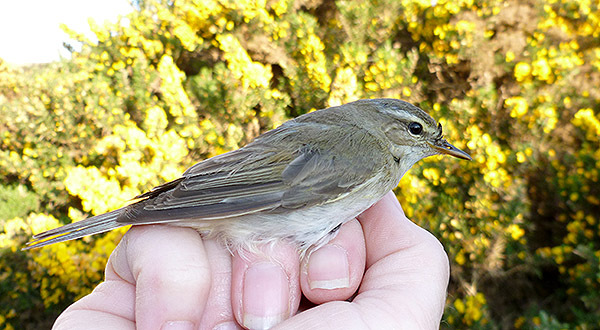 A nice surprise in the net a little later was a Willow Warbler with a ring on already – first of all i thought it was one of the ones from earlier in the day that had gone back in but on reading the ring number it was one of ours but not a recent bird. 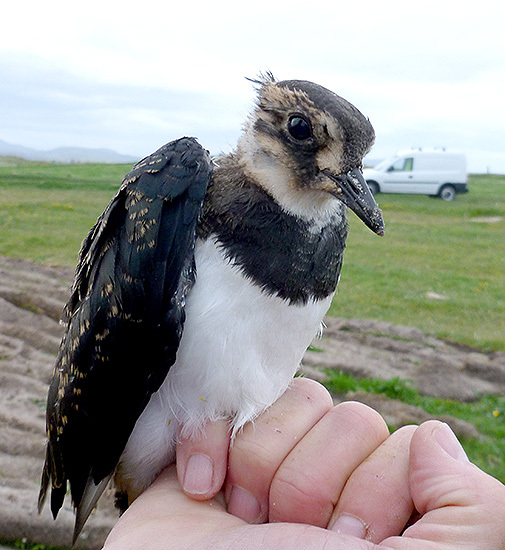 I took the bird back to the van and processed it and was able to look back in the book to find that we had first ringed it, at Druidibeg in June last year. 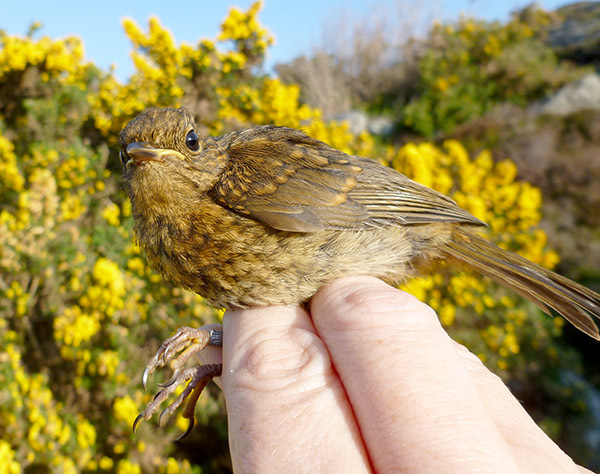 It never ceases to amaze me that such a tiny bird – it weighed in at less than 10g – has travelled all the way to Africa to overwinter then found it’s way all the way back to the same tiny plantation on the east side of Uist. 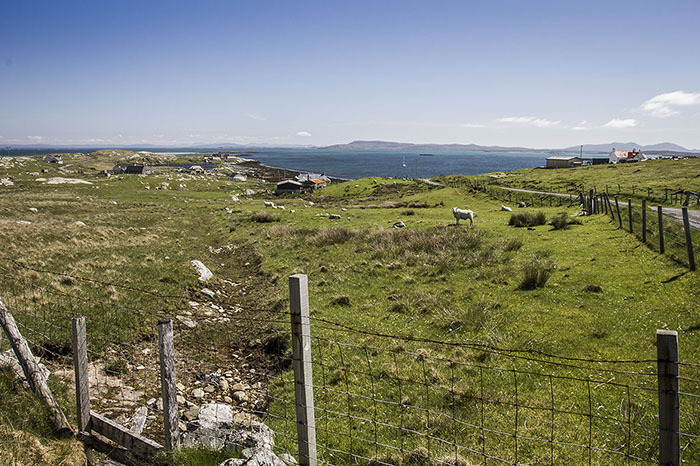 As there is never much about at Druidibeg (well, there had been a sighting of a Wryneck a couple of days previously) it’s not usually worth us both going so Ian had stayed at home. He texted to say he was catching reasonably well and had ringed both Siskin and Spotted Flycatcher. 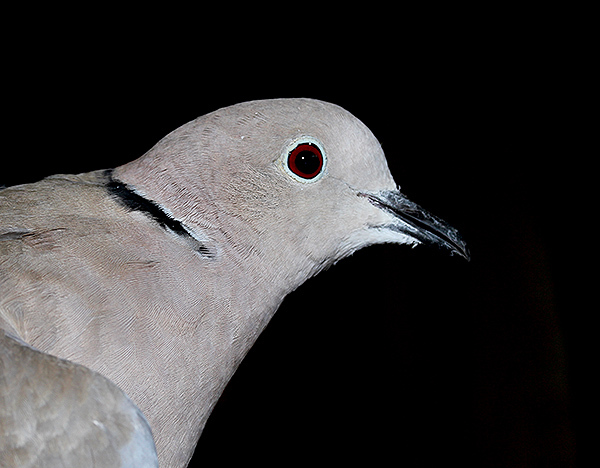 We’ve been noticing more and more Collared Doves around with up to 11 being seen on the electric wires at the back of the house and they’ve been increasingly visiting the garden to hoover up the seed we’ve been putting out for the sparrrows and finches. It was inevitable that we would catch a few. A few days ago I was fascinated to watch two juvenile Blackbirds in the garden. They hung around for ages, they had obviously not been out of the nest very long and were just standing around looking a bit like they didn’t really know what they were supposed to be doing. Every now and again the adult male Blackbird would come along and feed them and they eventually followed him into the field behind. I’m sure they’ll get the hang of it soon! There are so many young around at the moment! 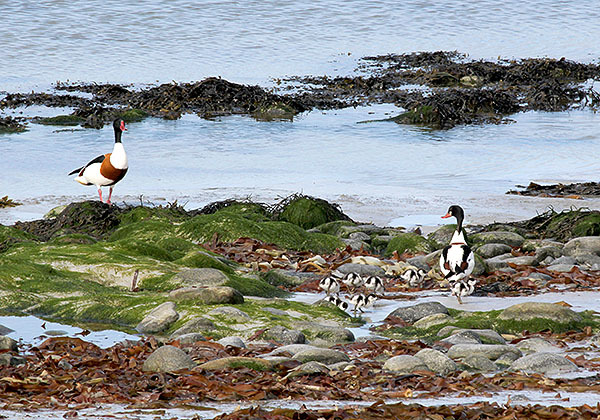 On a trip to Balivanich we had our customary stop-off at Stinky Bay and were happy to see a pair of Shelduck with their brood of 7, i don’t know what the official term is, i called them Shelducklings? I usually say “oh no don’t count them” because such is nature that every time you see them there are less and less! 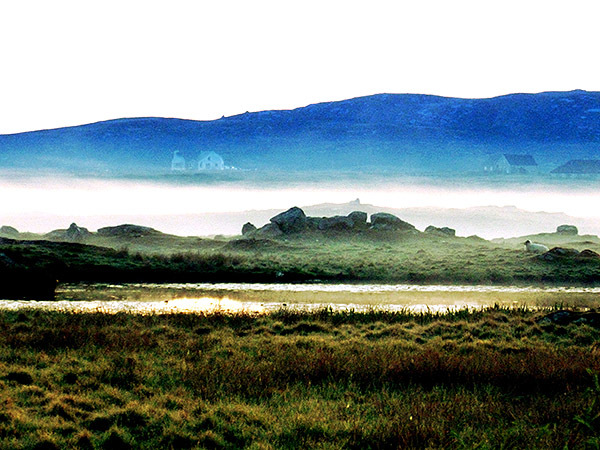 – Ian managed a fab photo. 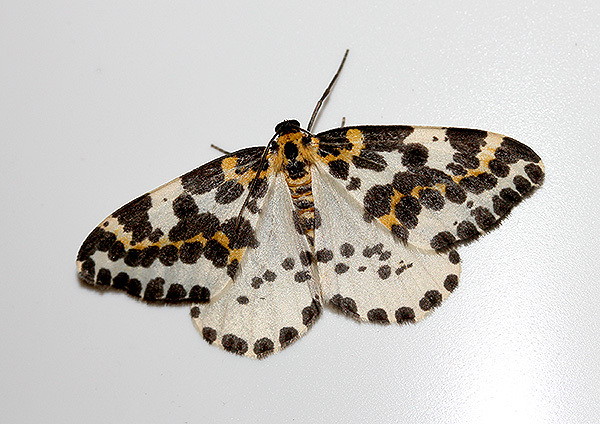 And finally the moth catching has at last been getting better. 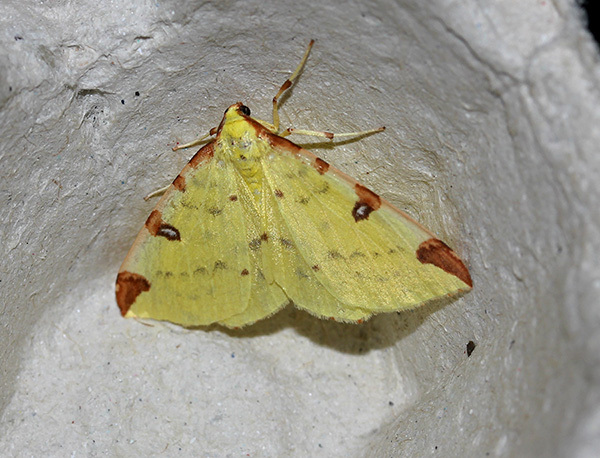 Our best catch of the season so far was on the 26th May when we had 42 moth of 21 species. Needless to say we had had the traps out in our neighbours garden – he’s been here at least 30 years and has the most enviable trees and vegetation! 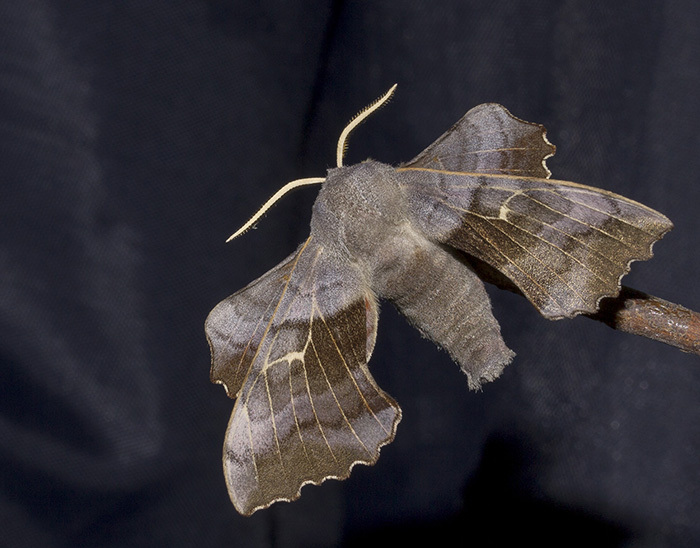 A small selection from our moth catch below. 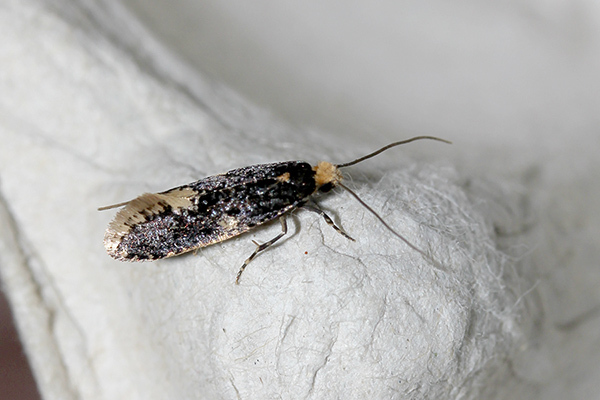 Pleurota bicostella, a micro moth, it's long hairy palps with spikes on are very distinctive. 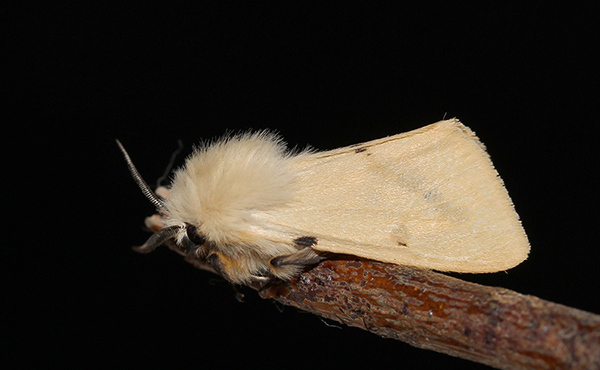 Fox Moth. We've been getting a fair few of these the last couple of weeks. 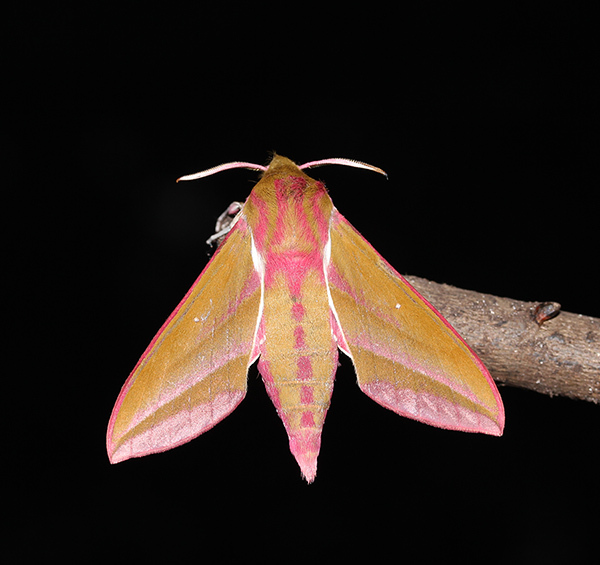 Elephant Hawk-moth - the other hawk-moth species in the trap these last couple of weeks. 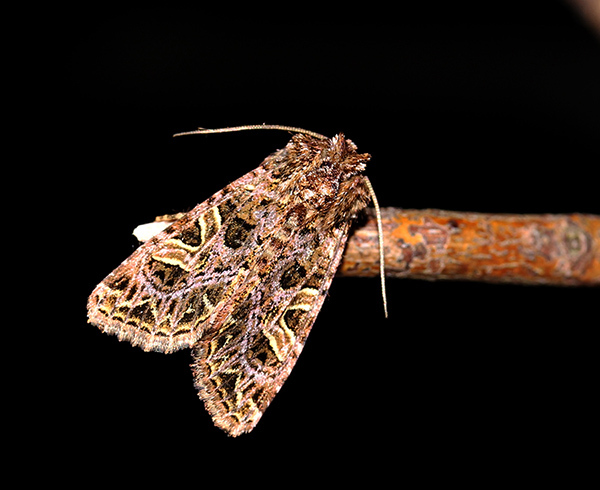 Knot Grass - one of the most abundant moths this last couple of weeks. 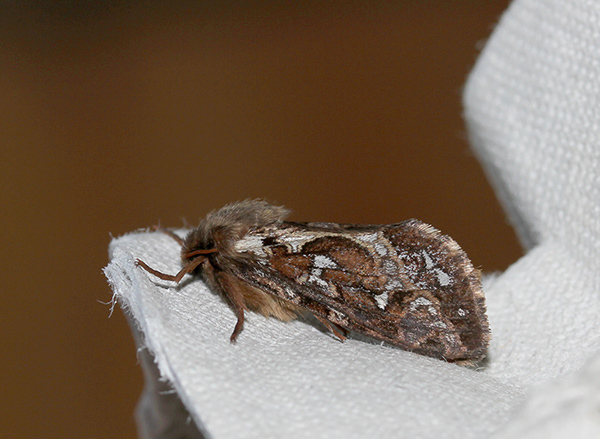 A bit of a surprise in the trap was this male Belted Beauty, i've only seen them out on the machair before. Well, that’s it for now. June looks like it is also going to be very busy and i think it might be easier to update the blog more frequently rather than one long once or twice weekly tome! Wild and windy last weekend which at last produced some skua passage – Arctic, Great, Long-tailed and Pomarine were seen from Ardvule. 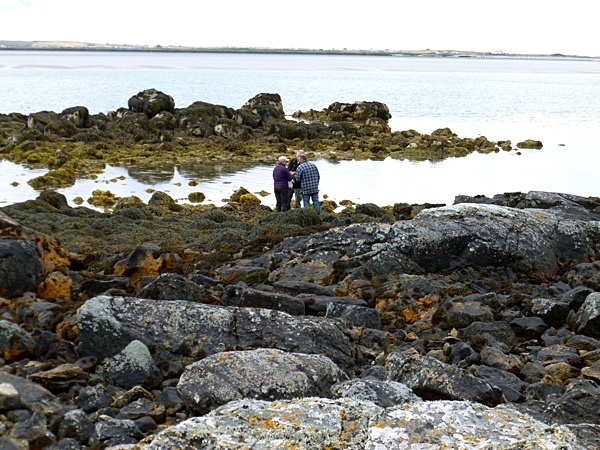 A very busy week with a pretty diverse range of activities – chick chasing and nest recording, breeding bird survey, birding and late in the week joining in with a seaweed hunt. 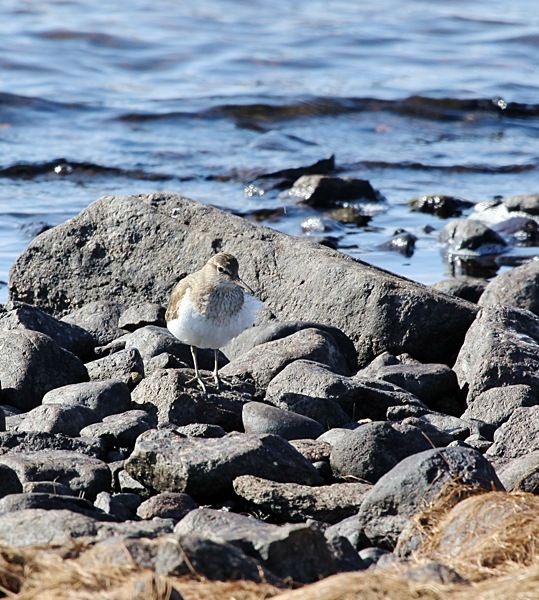 Ian was let loose with the camera and got this lovely shot of a Common Sandpiper. 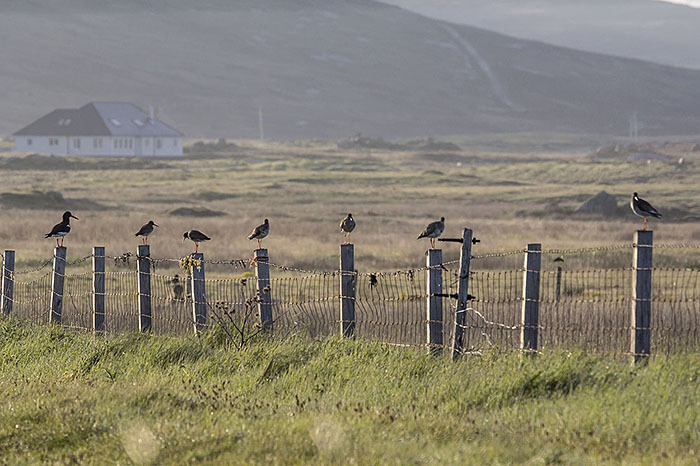 In just two days “chick chasing” produced 25 birds – all Lapwings. 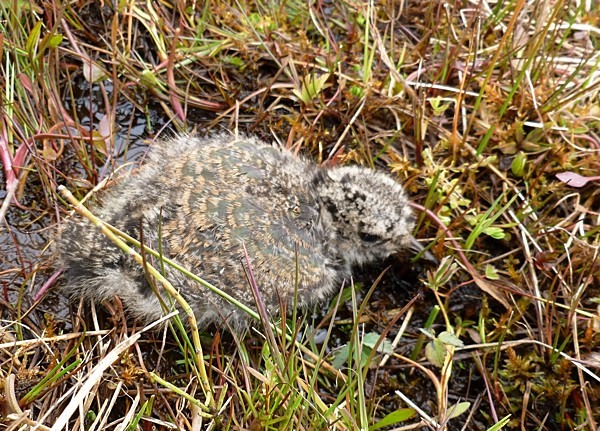 Lapwing chick trying to hide from us - they are amazingly well camouflaged! 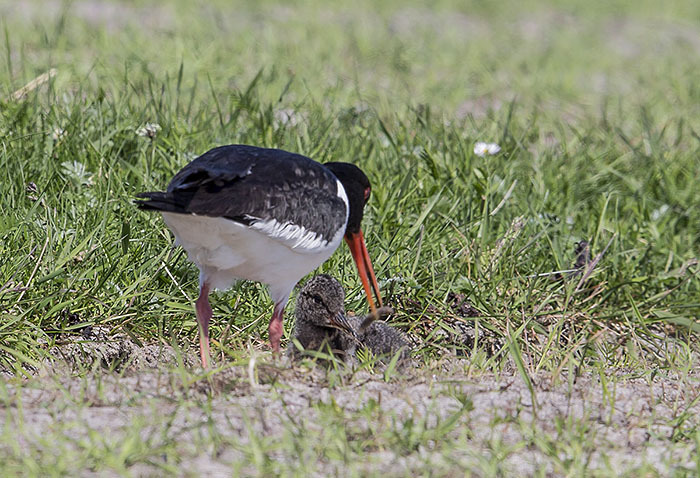 The Oystercatchers are still sitting tight this week – surely they will hatch soon? 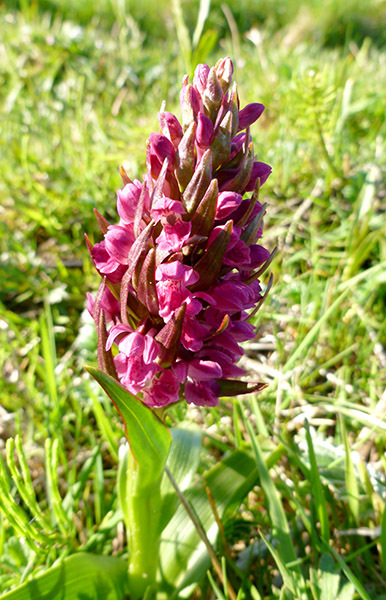 Friday 18th seemed like a good day to go and do the first visit on my Breeding Bird Survey (BBS) square – I can’t keep putting it off, the weather isn’t going to warm up! 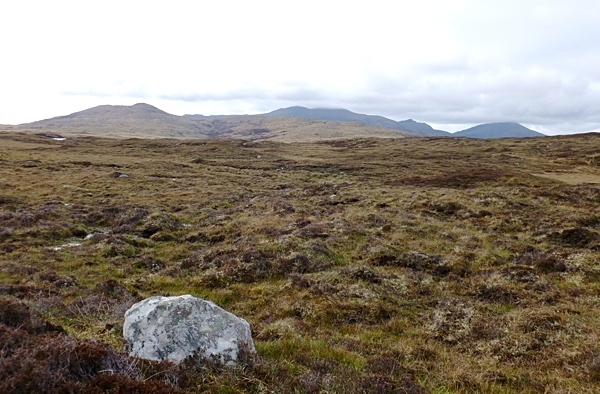 The 1km square is NF7841 and is fairly near to Loch Bee. 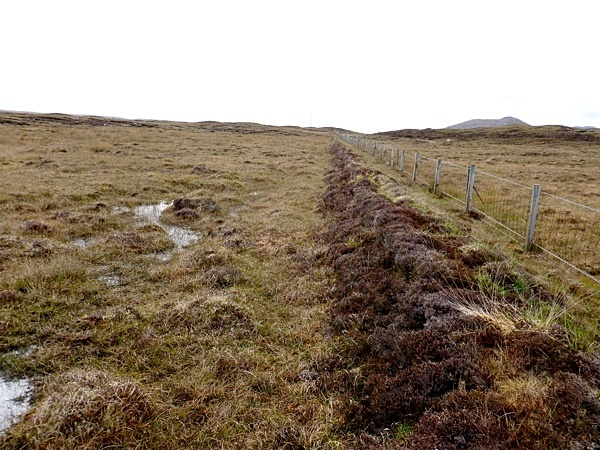 A long fence line seemed like a good marker to follow over the boggy terrain – it was very soggy in places and I was really glad I had worn me wellies. 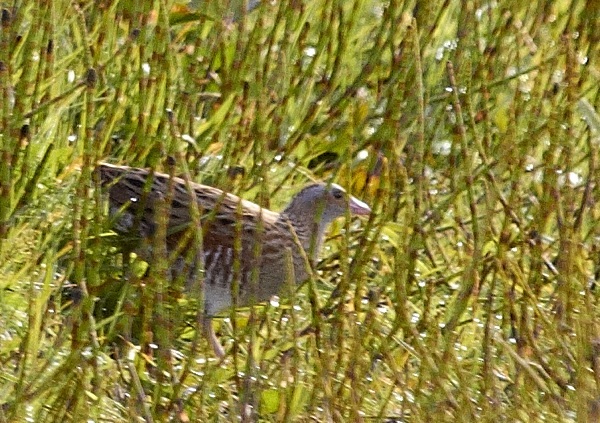 Managed to see 25 species which quite surprised me. A bit wet out there - glad i had my wellies on! At one point I was just about to climb a barbed wire fence when I spotted this spider on the wire. Now, I’m not much of a spider fan but our next door neighbour is, and even to my arachnophobe mind it did look quite interesting so I stopped and took a few photos. 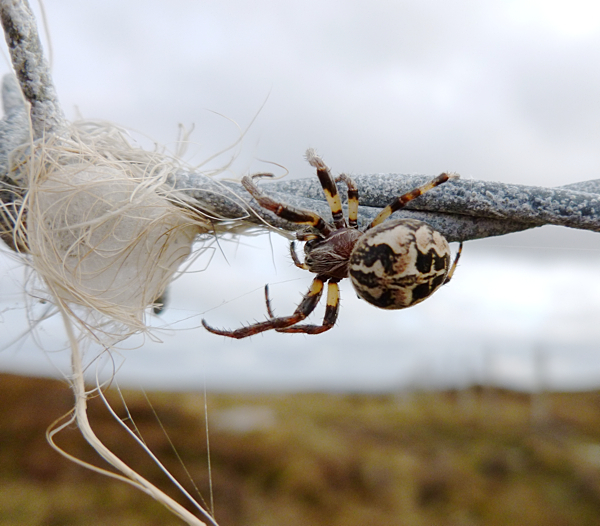 I believe it to be a Furrow Spider (Larinioides cornutus) which is an orb-weaver spider and looking at the NBN Gateway map has been recorded here in South Uist previously. 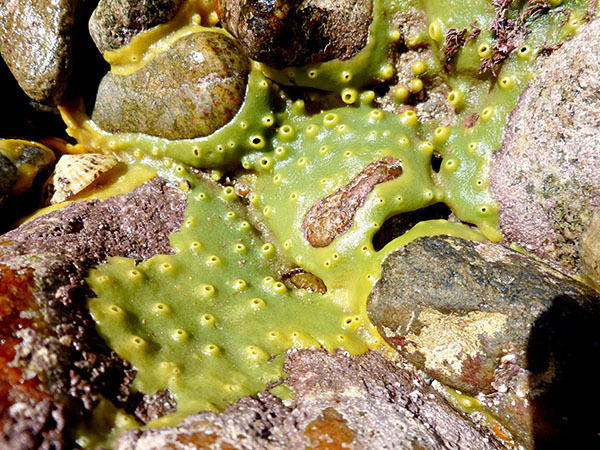 They usually live near water and spend the day time in the “nest” that it makes. 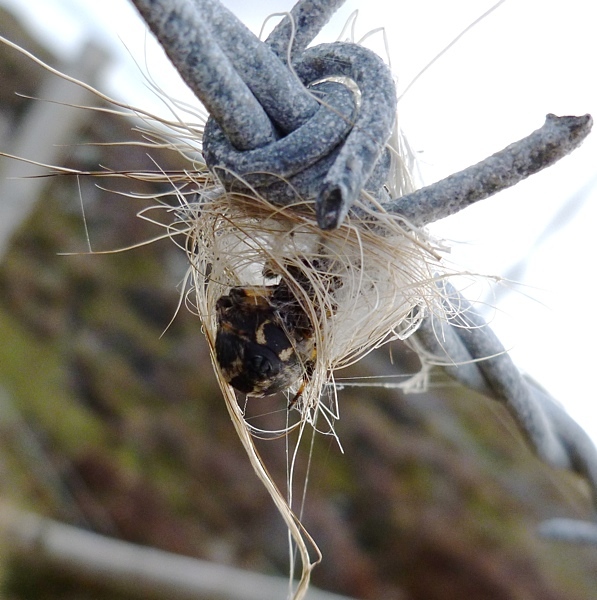 Heading back into it's wee nest - i disturbed it as i was just about to get over the fence here! 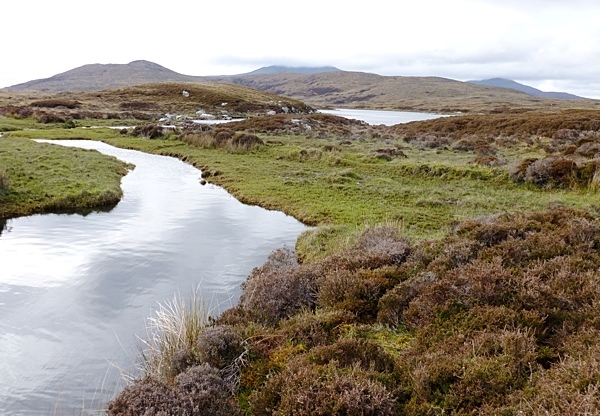 I think I overdressed for doing the survey – I had a long-sleeved t-shirt, two fleeces and a waterproof coat on, trousers, waterproof leggings, thick socks and wellies – oh and my daft hat. I arrived back at the van absolutely sweltering! Maybe I’m just unfit?! 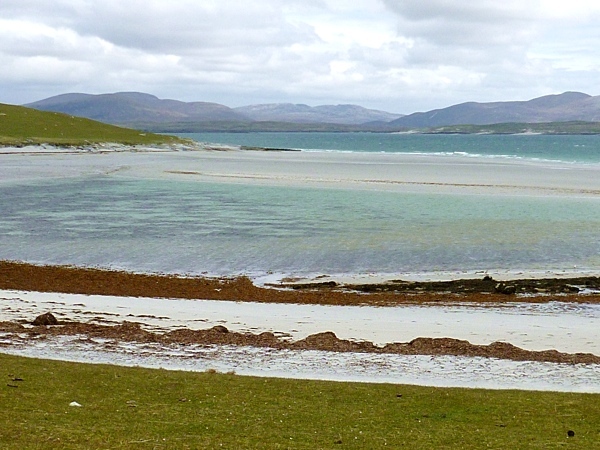 Berneray - not a bad spot for a picnic! 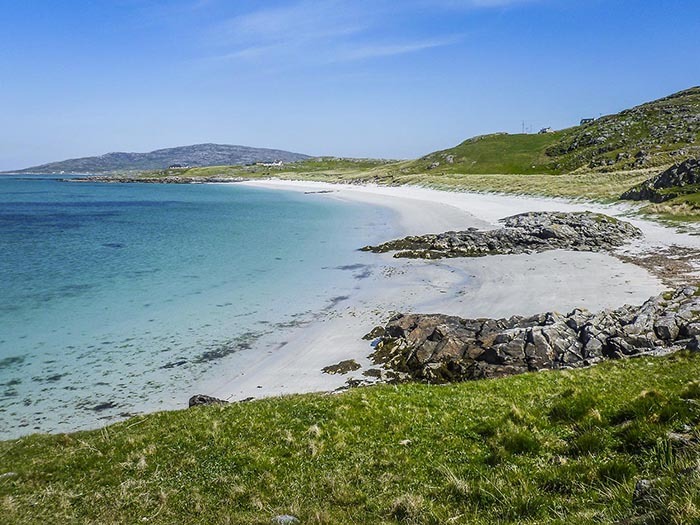 We always like to learn about something new so when Curracag (the local Natural History Society) advertised an event to be run during Scottish Biodiversity Week we thought we would go along. 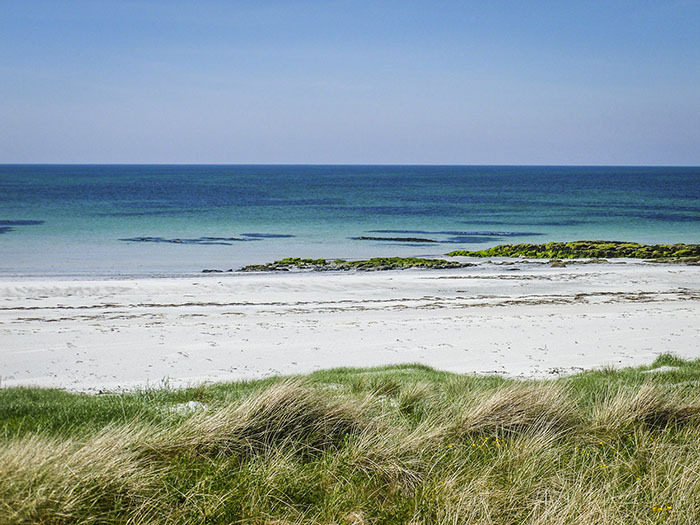 It was called The Big Seaweed Hunt and took place at Carinish, North Uist. 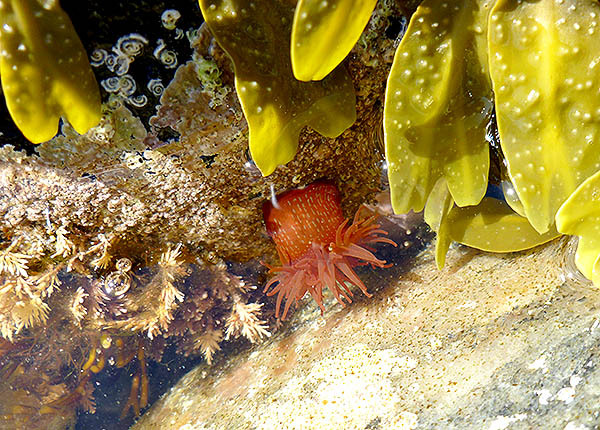 All this fun had a serious side to it – we learned that seaweeds are “simple plant-like organisms called algae” and that many animals rely on them for food and shelter. 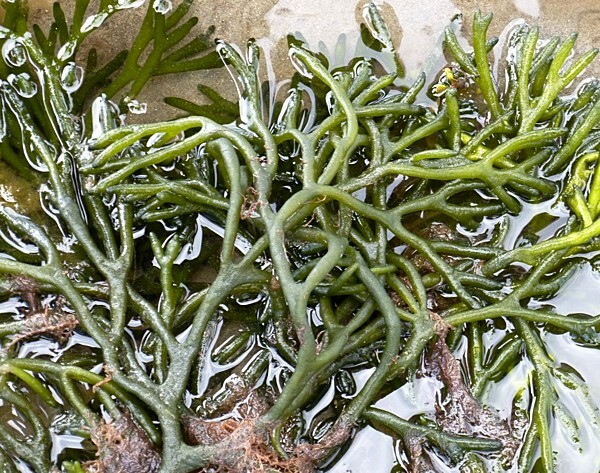 We also learned that, rather worryingly, and in common with many other plants and animals, seaweeds are responding to climate change and rising sea levels. 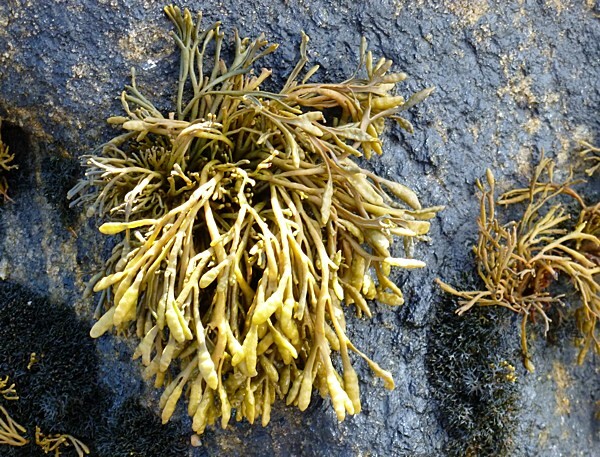 There is an invasive species called Wireweed – it was first recorded in 1973 in the Isle of wight and has been gradually spreading north. 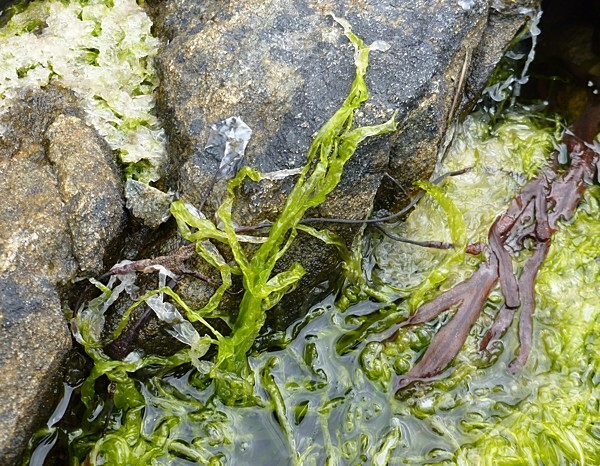 Before going along to this event I knew absolutely nothing about seaweed and didn’t realise the diversity that you could find in just one very small inlet. We found at least 6 different species plus a few more unidentified species which Tracey (who led the meeting) took home to identify. 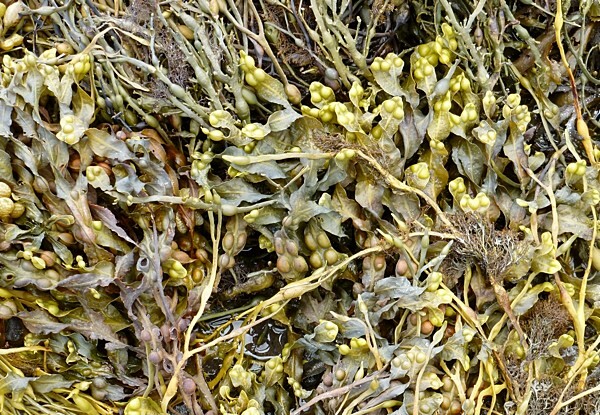 The 3 most common seaweeds there were Egg Wrack, Bladder Wrack and Channelled Wrack. We left the meeting fairly well enabled to be able to survey our own chosen patch of beach so that we can now take part in our own Big Seaweed Search – the results of which we will be able to enter on their website at: www.nhm.ac.uk/seaweeds Take a look at the web site it has loads of information both about the survey and seaweeds in general. 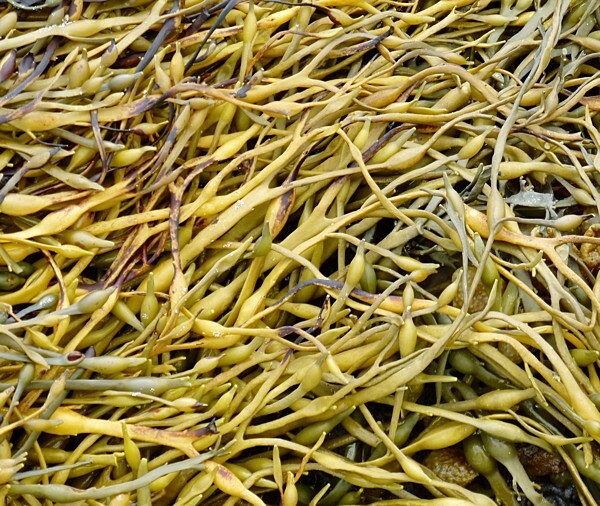 I also found quite a handy (if a little technical) key in the Field Guide to British Seaweeds found on The National Marine Biological Analytical Quality Control Scheme website. 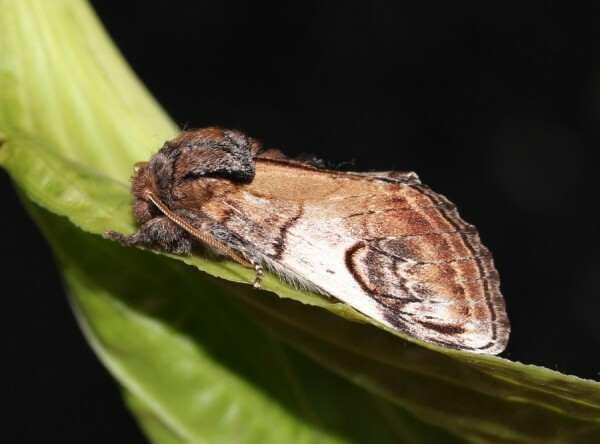 Moth trapping has still been very dire – the cold northerly wind continues and the only night it turned south-easterly we caught just 2 moths – a single Red Chestnut and a lovely Pebble Prominent (almost four weeks earlier than our first one last year). 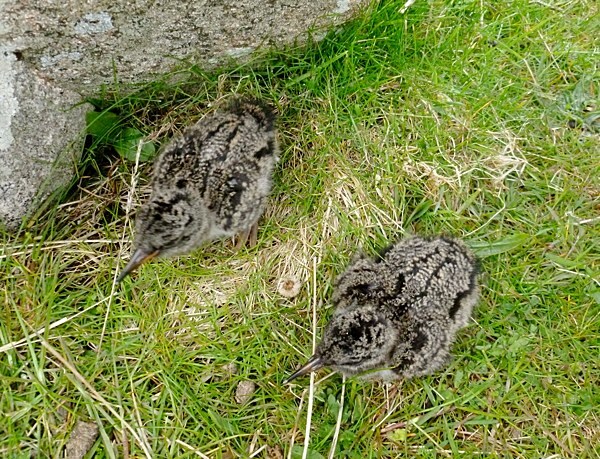 On the 20th we caught and ringed our first Oystercatcher chicks of the year – I tell you what, for something so small they can’t half run fast! 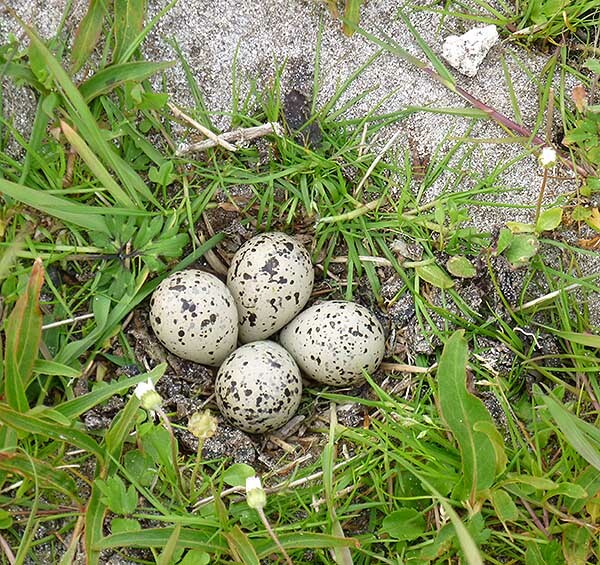 Four tiny Lapwing chicks, still in the nest - an unusual find! A busy week – the nights are definitely getting shorter! The weather has been excellent, very little wind early in the day, a little cold though with temperatures down to just -0.2’C. 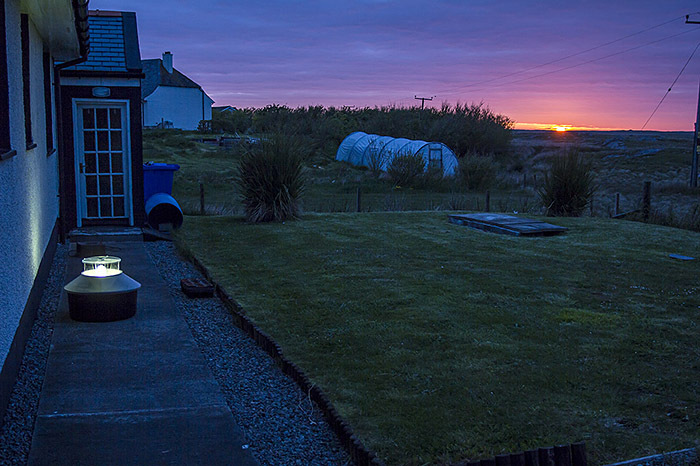 Our routine for the last week has been to get up at around 5am to turn off the moth trap, have a quick bite of breakfast then head out to the machair to nest find and to see if we can find any chicks to ring. 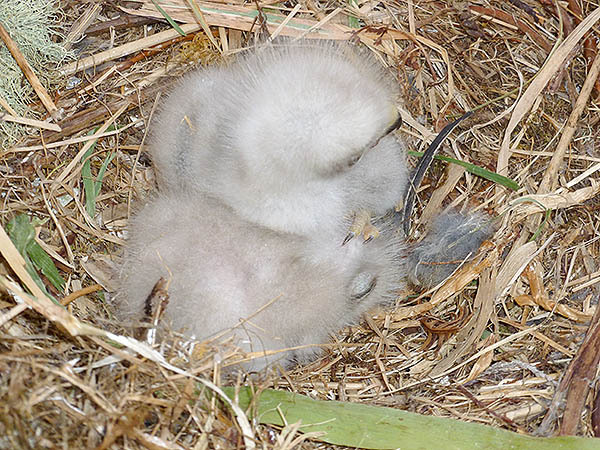 We’ve had more success with the chick chasing than this time last year – the weather was so awful last May very very wet – then it rained every single day apart from the first three. We made a conscious descision then not to chase any chicks in those conditions, the poor things were having a hard enough time as it was. 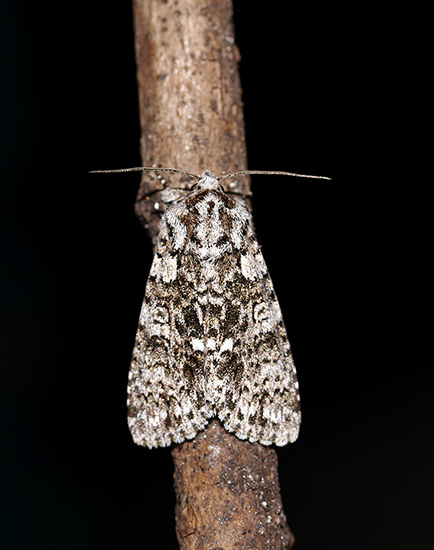 Amongst the very few moths in the trap we were happy to find our first Puss Moth of the year. 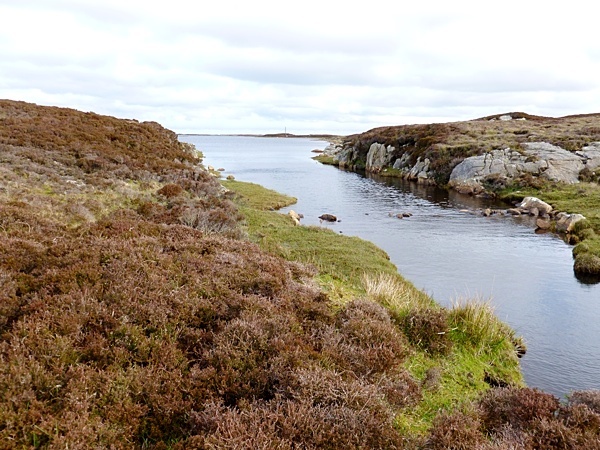 After finishing on the machair we have been calling in to North Locheynort – a small wooded oasis on the east side of South Uist. 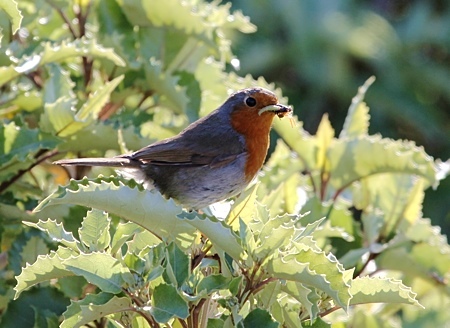 The smaller birds there are also busy nesting – this Robin must have young, we saw it carrying food. Once back at home, time for a quick cuppa then if it’s not too windy get the nets open and the ground traps out – if the wind has increased too much we just run the ground traps. 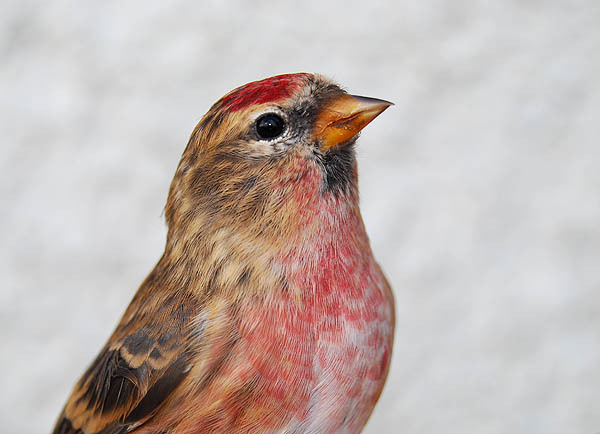 “Our” Lesser Redpoll has been a frequent visitor – we first ringed him (with ring number V548458) in August 2010 and he returned in Spring 2011, staying for a few months and seen then in the company of a Common Redpoll – we were unable to confirm breeding. 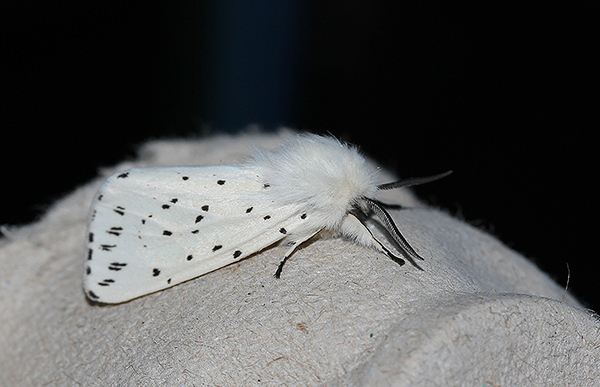 We are very very happy to see V548458 back this spring – within a few hours he was in the trap and we were able to positively confirm his identity. 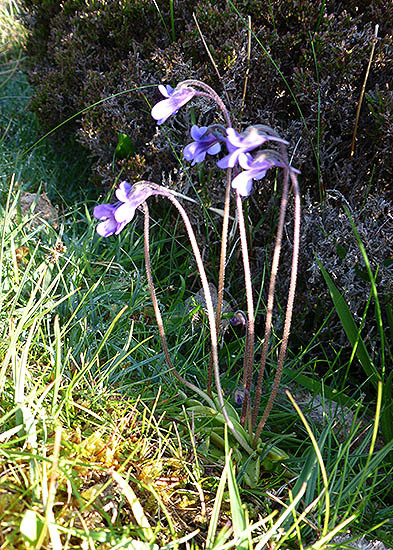 Monday 7th May, we continued the early morning start – it was cold – having dropped below zero overnight – the car was well frozen! When we went to get the moth trap in there was a Large Red Damselfly on the wall nearby – perhaps it had been attracted by the warmth of the bulb! 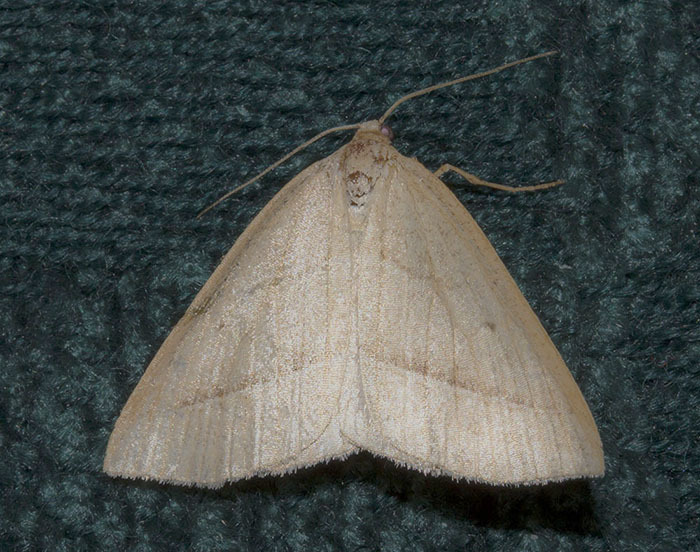 There were no moths in the trap. We had a leisurely breakfast as we didn’t want to be disturbing the birds too much on such a cold morning. At the beach at Kilpheder there were quite good numbers of waders, including 4 Knot which were beginning to come into summer plumage. 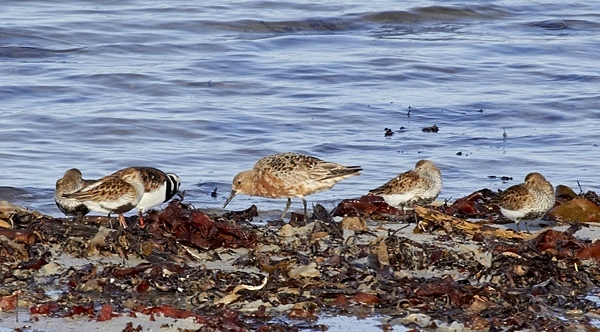 There was also a single Grey Plover and 26 Bar-tailed Godwits plus many Dunlin and Sanderling. 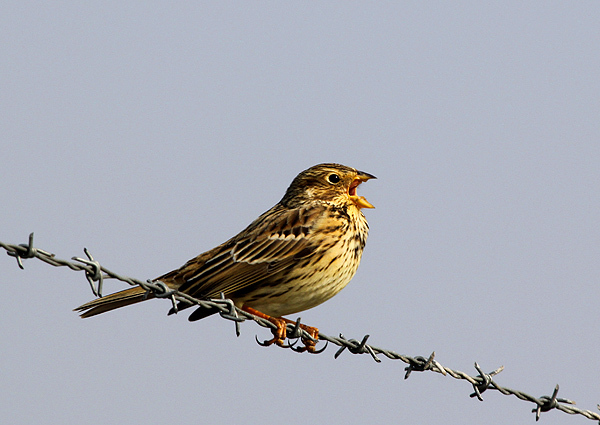 A little further along the machair we were pleased to hear a couple of singing male Corn Buntings – i never seem to be able to get photos of these guys sitting on something more photogenic than barbed wire! 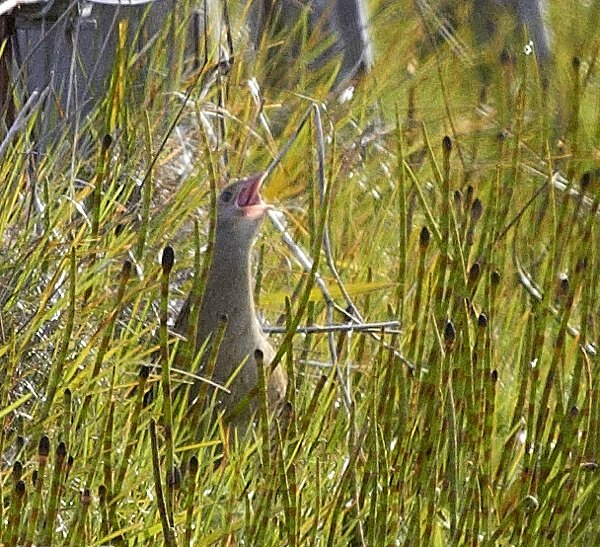 A minute or two later another first of the year – a calling Corncrake! 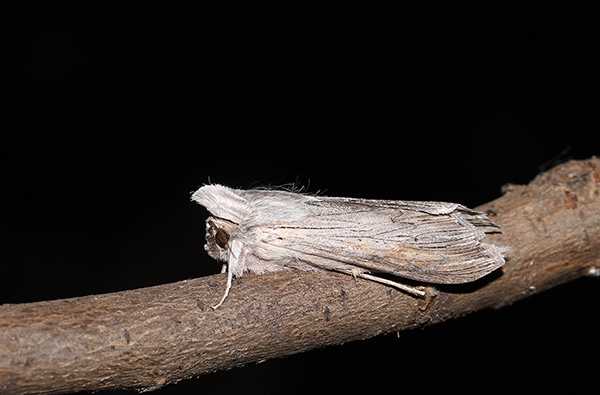 They’re skulky little devils at the best of times but around now when the ground vegetation is still really sparse is about the best time to see them. Managed to get a photo anyway – it’s a bit fuzzy as it is heavily cropped, the bird was quite far away even for the 400mm lens. 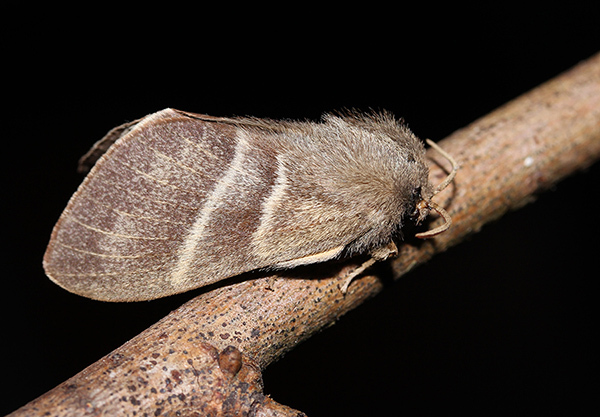 Much of the same planned for the coming week – chick chasing and nest monitoring and hopefully the weather will begin to warm up so that we can catch some moths at last! 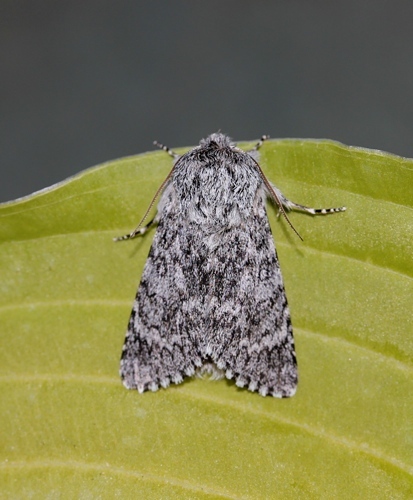 Things have been pretty slow recently with regards to moth-trapping – for almost all of the last month there has been some north in the wind making it pretty cold. 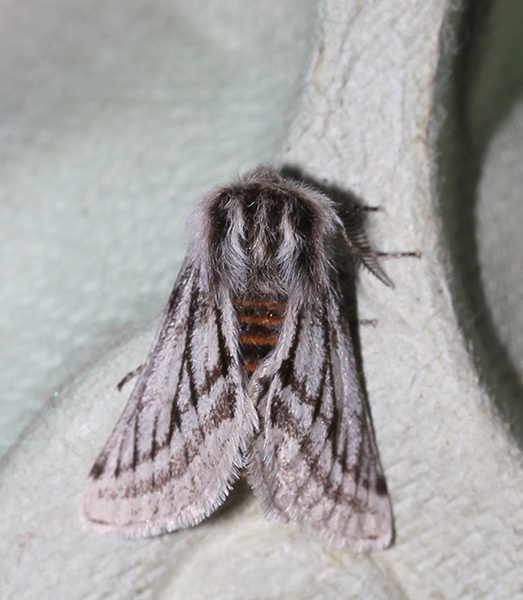 Just 7 Hebrew Characters and 3 Red Chestnuts plus we were very happy to find the nationally scarce Sweet Gale Moth in the trap – a moth we haven’t seen before. 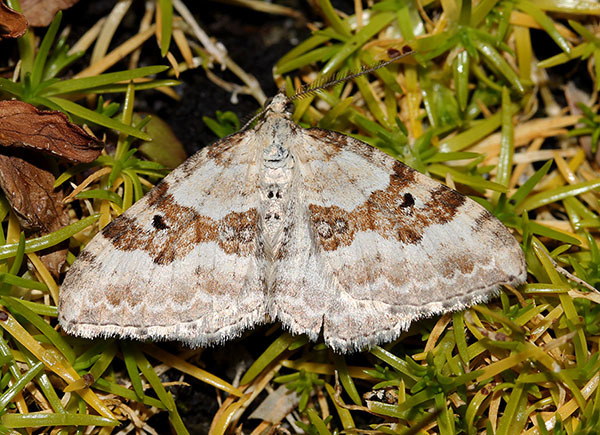 The County Moth Recorder tells us that it is only the second location here in the hebrides that the moth has been recorded at. 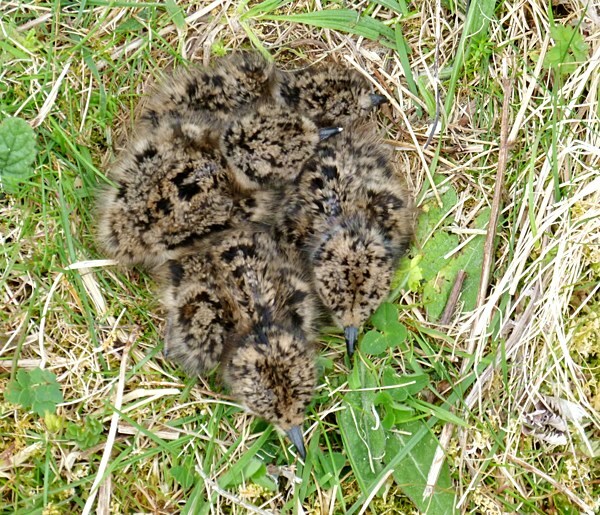 Our first Lapwing chicks of the year seen at Stoneybridge this morning and we managed to catch and ring them. There were also 22 Whimbrel between Stoneybridge and Howbeg. 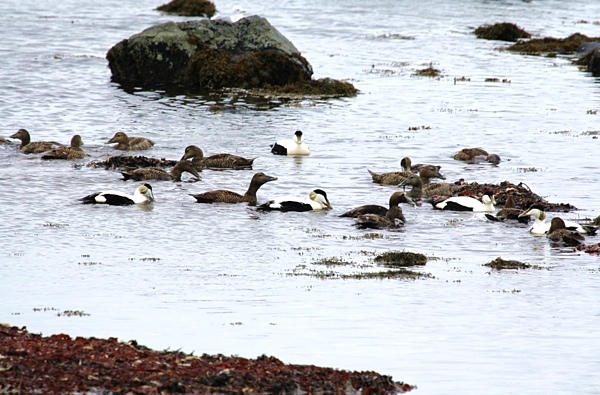 The King Eider was not at Rubha Ardvule first thing this morning but there were still 23 pale-bellied Brents still on the beach plus our first Arctic Tern of the summer. 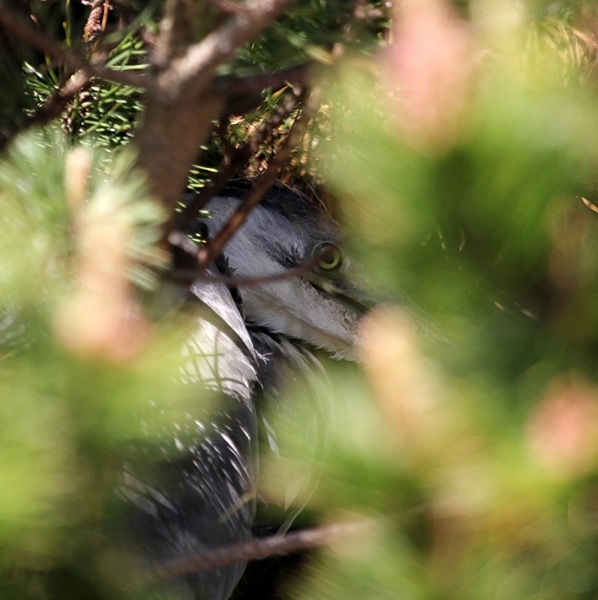 The Herons are busy nesting in the area as well, this youngster was seen skulking around in the vegetation – it seems to be old enough to go walkabout but not yet big enough to be able to fly. There was also a small flock of 8 Siskins, quite a few Willow Warblers and a Chiffchaff around the wooded area. 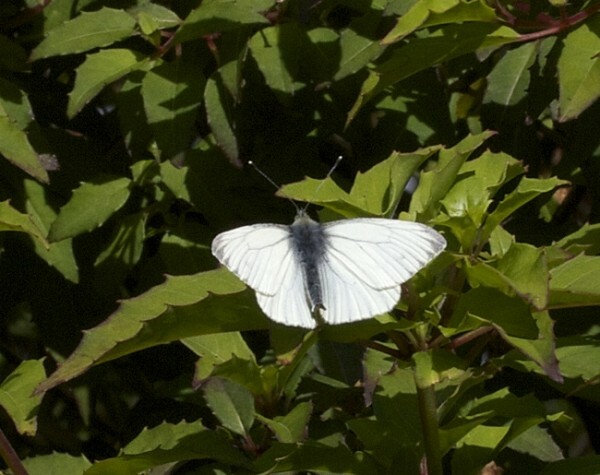 We counted quite a few Green-veined White butterflies that were in the warmer, more sheltered areas.